By 2050, the global demand for food will nearly double, numbers of farmers are predicted to decrease and the amount of suitable farmland is not expected to expand. 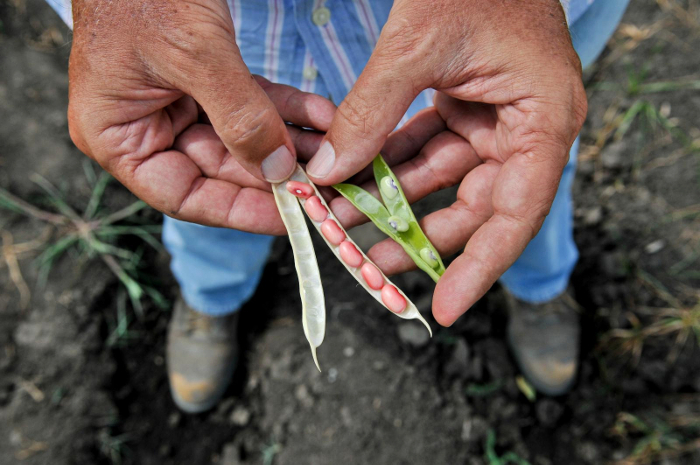 To meet these challenges, farmers will rely on plant breeders becoming more efficient at producing crop varieties that are higher yielding and more resilient. 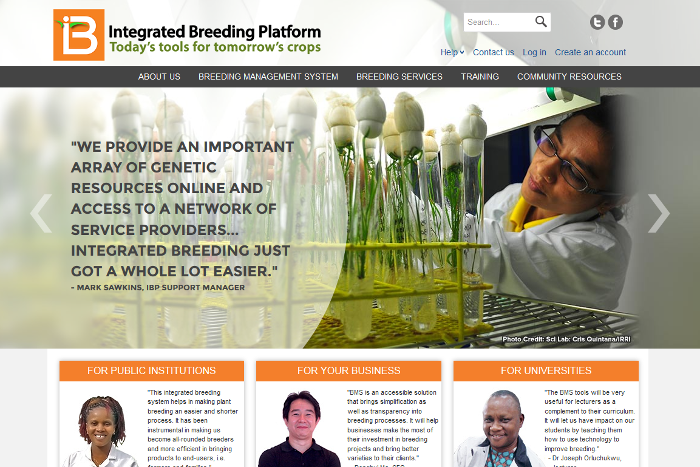 The Integrated Breeding Platform (IBP), established by the CGIAR Generation Challenge Programme (GCP), provides plant breeders with state-of-the-art, modern breeding tools and management techniques to increase agricultural productivity and breeding efficiency. Its work democratises and facilitates the adoption of these tools and techniques across world regions and economies, from emerging national programmes to well-established companies. 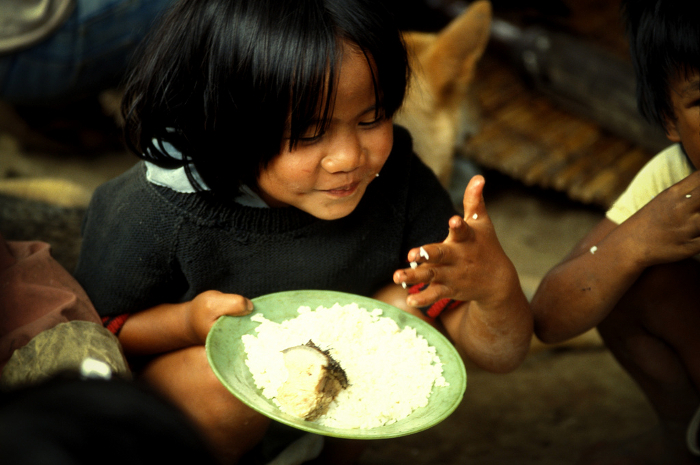 In particular, it is helping to bridge the technological and scientific gap prevailing in developing countries by providing purpose-built informatics, capacity-building opportunities and crop-specific expertise to support the adoption of best practice by breeders, including the use of molecular technologies. This will help reduce the time and resources required to develop improved varieties for farmers. 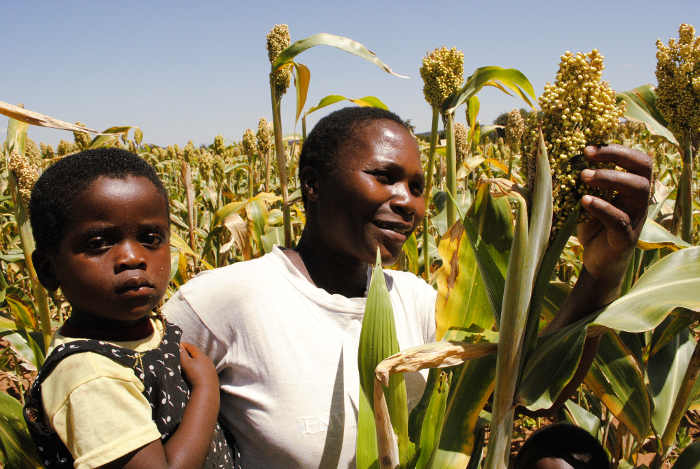 IBP is certainly a winner for maize breeder Thanda Dhliwayo of the International Maize and Wheat Improvement Center (CIMMYT): “IBP is the only publicly available integrated breeding data-management system. I see a lot of potential in increasing efficiency and genetic gain of public breeding programmes,” he says. For Graham McLaren, who was GCP’s Bioinformatics and Crop Information Sub-Programme Leader, an informatics system is vital for advancing the adoption of modern breeding strategies and the use of molecular technologies. 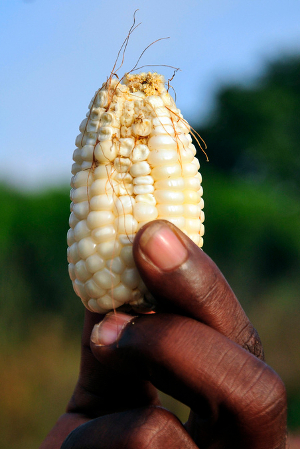 “One of the biggest constraints to the successful deployment of molecular technologies in public plant breeding, especially in the developing world, is a lack of access to informatics tools to track samples, manage breeding logistics and data, and analyse and support breeding decisions,” says Graham, who is now IBP Deployment Manager for Eastern and Southern Africa. Breeders access IBP’s services through its Web Portal. Knowledge is power, making data are almost a crucial a raw material for plant breeding as seeds. To make good choices about which plants to use, breeders need information from thousands of plant lines about a wide range plant of characteristics, usually collected during field trials or greenhouse experiments, in a process known as phenotyping. Effective information management is therefore critical in the success of a breeding programme. IBP tackles these crucial information management issues, and many of its current users are finding it invaluable for handling their phenotypic data. IBP also aims to facilitate the use of molecular-breeding techniques, which require genetic as well as phenotypic information (see box), and support users in integrating these into their breeding process. The advent and implementation of molecular breeding has increased breeders’ efficiency and capacity to generate new varieties – although the inclusion of genetic data has also added to the amount of information that breeders need to handle. 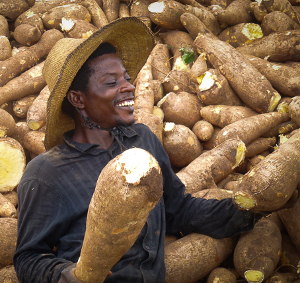 An abundant harvest of nutrient-enriched cassava in Nigeria. 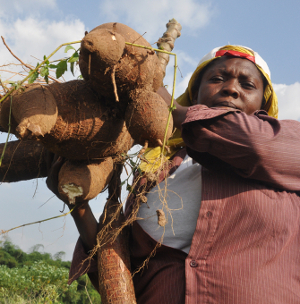 “Prior to molecular breeding, we would record our observations of how plants performed in the field [phenotypic data] in a paper field book; we would either file the book away or re-enter the data into an Excel spreadsheet,” says Adeyemi (Yemi) Olojede, Assistant Director and Coordinator in charge of the Cassava Research Programme at the National Root Crops Research Institute (NRCRI) in Nigeria and Crop Database Manager for NRCRI’s GCP-funded projects. By using molecular markers to make certain which plants have useful genes right from the start – simply by testing a tiny bit of seed or seedling tissue – breeders and agronomists like Yemi can carefully select which ‘parent’ plants to use. These are then crossed in just the same way as in conventional breeding, but using only the most promising parents makes each generation is a much bigger step forward. Another advantage for breeders is that they do not necessarily have to grow all of the progeny from each set of crosses – usually thousands – all the way to maturity to see which plants have inherited the traits they are interested in. 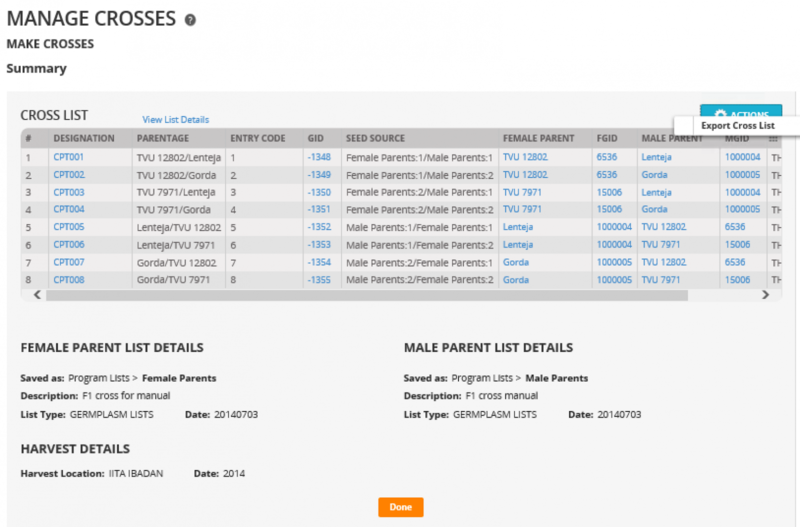 The IBP Breeding Management System makes it much easier for breeders to manage their data and make good use of both phenotypic and genotypic information. The Crossing Manager function facilitates the planning and tracking of crosses. All of this makes breeding more efficient, reducing the time and cost associated with field trials and cutting the cumulative time it takes to breed new varieties by half or more. 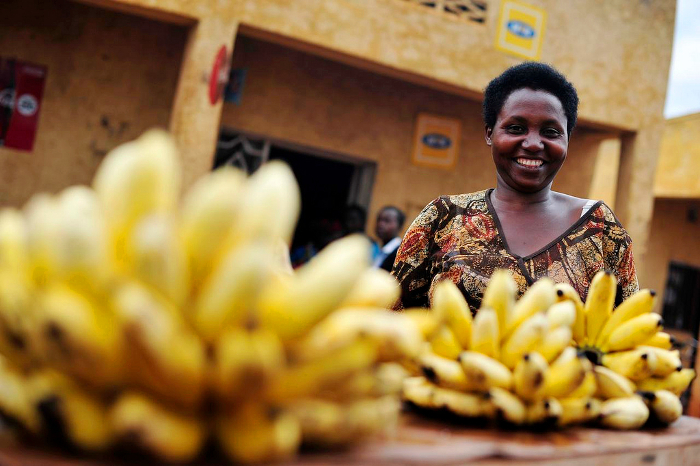 The end result is that farmers get the new crop varieties they need more quickly. Keeping track of masses of information has always been a headache for breeders. However, the increased burden of data management that molecular breeding brings – together with the need to be able to carry out specialised genotypic analysis (study of the genetic make-up of an organism) – has proved to be a limitation for many public national breeding programmes such as NRCRI. 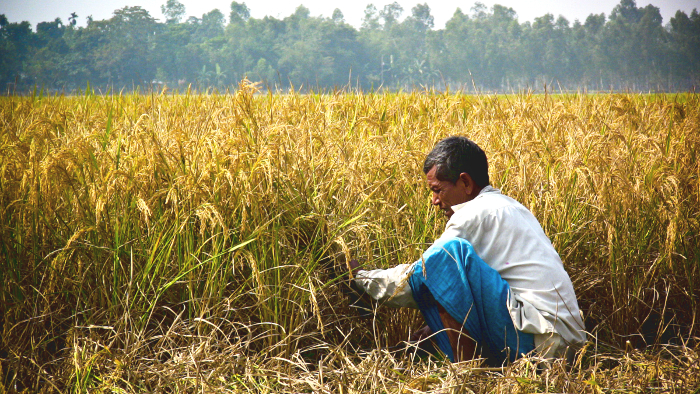 These have consequently struggled to adopt molecular-breeding techniques as readily as the private sector. 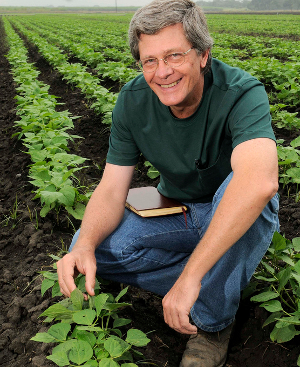 Wanting to overcome this limitation as part of its mission to advance plant science and improve crops for greater food security in the developing world, in 2009 GCP gave Graham McLaren the momentous task of overseeing the development of the Integrated Breeding Platform. The IBP Web Portal provides information and access to services and crop-specific community spaces. These help breeders design and carry out integrated breeding projects, using conventional breeding methods combined with and enhanced by marker-assisted selection methods. The Portal also provides access to downloadable informatics tools, particularly the Breeding Management System (BMS). 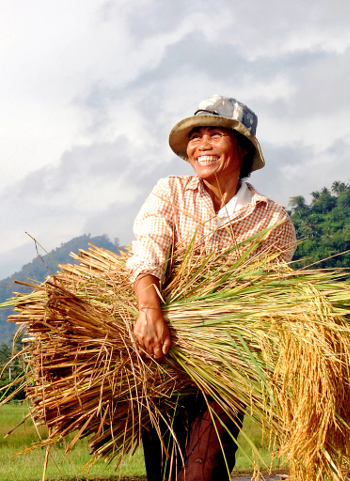 While there are multiple analytical and data-management systems on the market for plant breeders, what sets the BMS apart is its availability to breeders in developing countries and its integrated approach. Within a single software suite, breeders are able to manage all their activities, from choosing which plants to cross to setting up field trials. 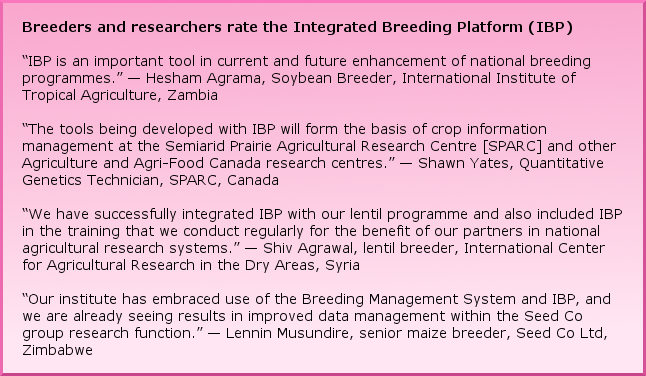 The IBP Breeding Management System has a complete range of interconnected tools. The Germplasm Lists Manager supports breeders in managing their sets of breeding materials. Another feature of the Platform is that it provides breeders with access to genotyping services to allow them to do marker-assisted breeding. 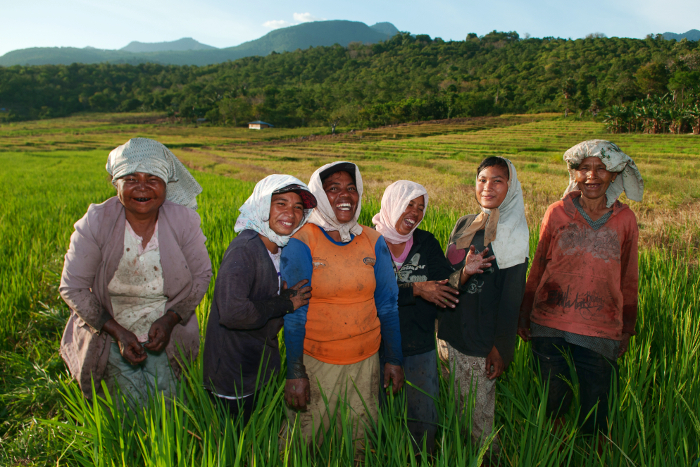 This is particularly useful for breeders in developing countries, who often don’t have the capacity to do this work. “It’s about giving all breeders the opportunity to enhance the way they do their job, without breaking the budget,” says Graham. Graham concedes that this aspiration for the Platform has not yet been fully realised. However, he is hopeful that by providing training, coupled with the support from several key institutes and breeders, these communities will help to increase adoption of IBP and its tools. 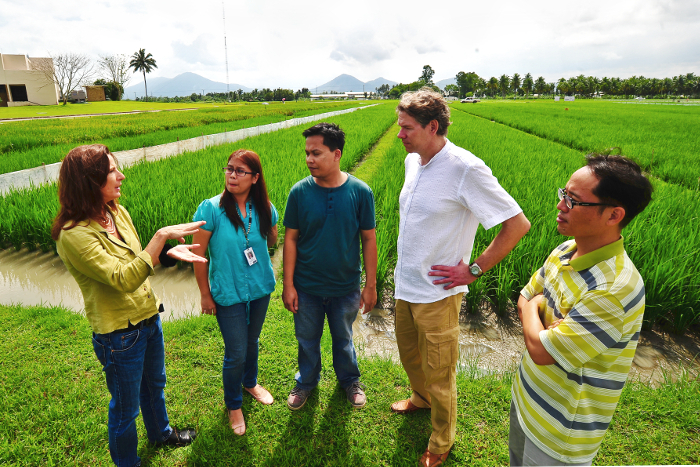 For Guoyou Ye, a senior scientist with the International Rice Research Institute (IRRI), participating in IBP meant that he has gained a lot more understanding about the needs of breeders in developing countries for user-friendly tools. “I started to spend time doing something for the resource-poor breeders. This has resulted in many invitations by breeding programmes in different countries to conduct training, and has given me a chance to establish a network for future work. I also had the chance to work with internationally well-known scientists and informatics specialists,” he says. 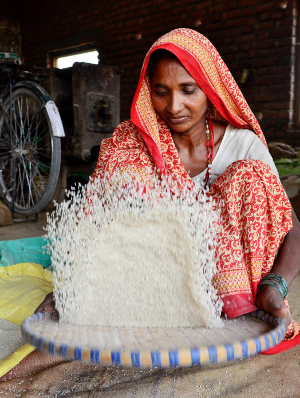 Freshly threshed rice in India. Yemi has also helped the IBP team run workshops for plant breeders throughout Africa. He recounts that attendees were always fascinated by IBP and the BMS, but cautious about the effort required to learn how to use it. They were pleased, though, when they received step-by-step ‘how to’ manuals to help them train other breeders in their institutes, with additional support to be provided by IBP or Yemi’s team in Nigeria. IBP is continuing to run these training courses, through newly established regional hubs in Africa and Asia. Mark Sawkins, IBP Deployment Manager for West and Central Africa, is helping to coordinate the formation and integration of the regional hubs within key agricultural institutes, including the Africa Rice Center in Benin, Biosciences Eastern and Central Africa (BecA) in Kenya, Centre d’étude régional pour l’amélioration de l’adaptation à la sécheresse (CERAAS) in Senegal, the Chinese Academy of Agricultural Sciences (CAAS) in China, the International Crops Research Institute for the Semi-Arid Tropics (ICRISAT) in India, the International Institute of Tropical Agriculture (IITA) in Nigeria, and the National Center for Genetic Engineering and Biotechnology (BIOTEC) in Thailand. Several further hubs are planned in additional countries, including in Latin America. 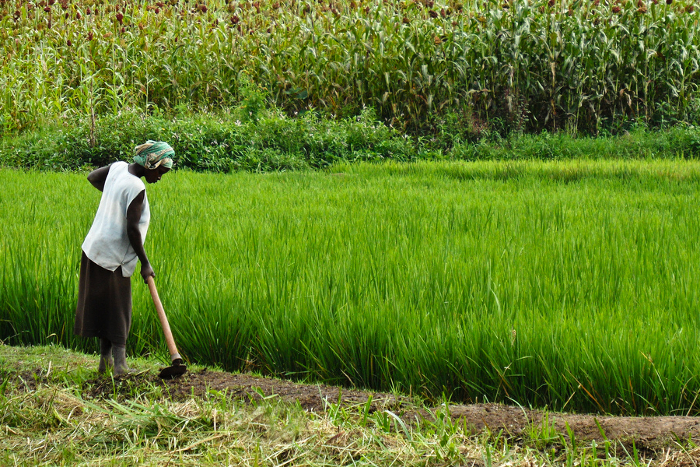 For Mounirou El-Hassimi Sow, a rice breeder from the Africa Rice Center, IBP is more than just a tool that helps him manage his data: “I’m seeing the whole world of rice breeders as a small village where I can talk to everyone,” he says. Social networking tools are a novel feature incorporated into IBP to further develop the capacity of breeders like Mounirou. 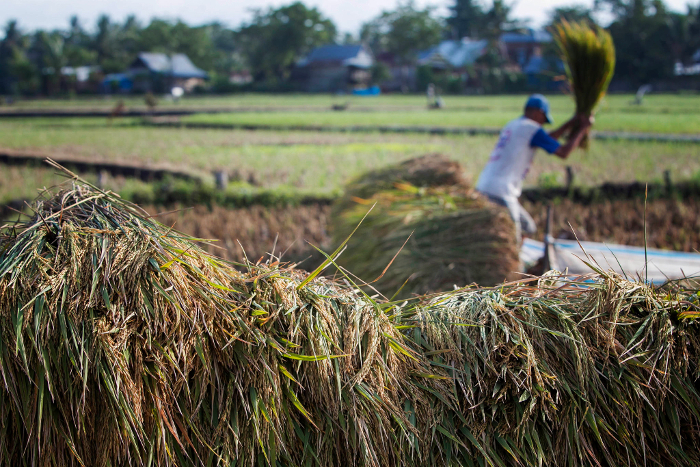 IBP hosts a number of crop-based and technical Communities of Practice that were established by GCP. These have nurtured relationships between breeders across different countries and organisations, encouraging knowledge sharing and support for young scientists. 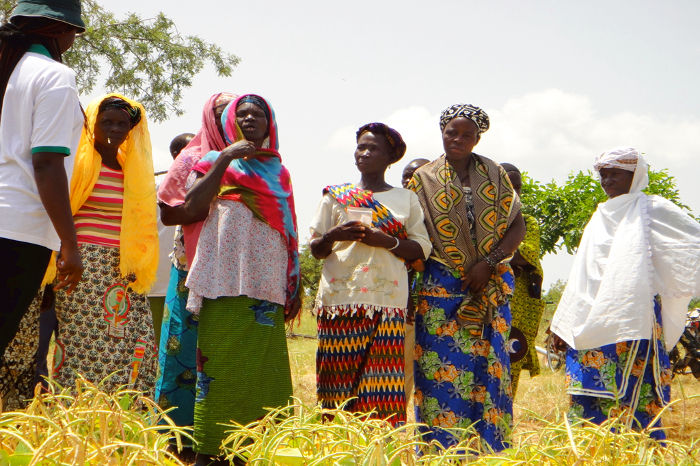 Another way GCP has promoted and developed capacity to use IBP and molecular-breeding techniques is through training. Starting in April 2012, the Integrated Breeding Multiyear Course (IB–MYC) trained 150 plant breeders and technicians from Africa and Asia. The participants attended three two-week intensive face-to-face training workshops spread over three years, with assignments and ongoing support between sessions. 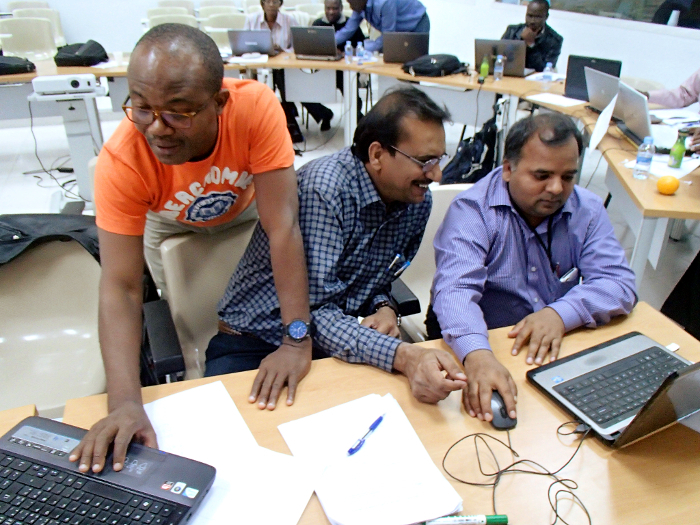 Roland Bocco (Africa Rice center, Benin), Dinesh K. Agarwal (ICAR, India) and Susheel K. Sarkar (ICAR, India) work together on a statistics assignment during their final workshop of the Integrated Breeding Multiyear Course (IB–MYC). 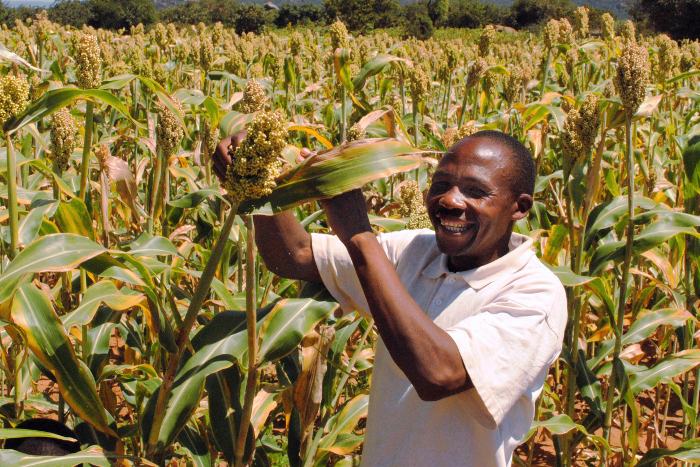 A maize farmer and community-based seed producer in Kenya. IBP has been the single largest GCP investment. 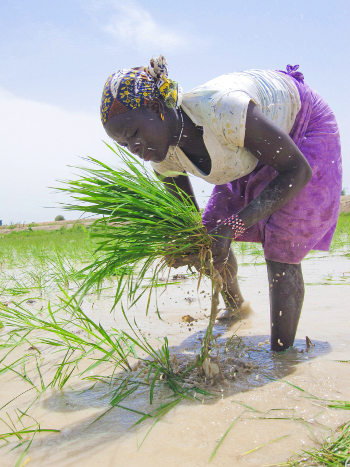 From 2009 to 2014, GCP allocated USD 22 million to the initiative, with financial support from the Bill & Melinda Gates Foundation, the European Commission, the UK Department for International Development, CGIAR and the Swiss Agency for Development and Cooperation. This represented 15 percent of GCP’s entire budget. Following GCP’s close in December 2014, IBP will continue to develop and improve over the next five years, with funding primarily originating from the Bill & Melinda Gates Foundation. While the priority has been on informatics and service development in Phase I, the main focus of Phase II will be to concentrate on deployment and adoption. In the long term, the Platform is seeking further ongoing funding, and also looking into implementing some form of user-contribution for specialised or consulting services. Stewart Andrews, IBP Business Manager, is helping to make this happen. The IBP team is convinced that rolling out IBP will have a significant impact on plant breeding in developing countries. Indeed, so far there have been more than 1,300 unique downloads of the BMS, with at least 250 early adopters worldwide using the software suite across their day-to-day breeding activities. The Platform’s strategy now builds on three regional teams (West and Central Africa, Eastern and Southern Africa, and South and South East Asia), each including experienced breeders and data managers. With the help of local representatives at seven well-established Regional Hubs to date (with more Hubs in development), this strategy has thus far yielded commitments from six African countries at the national level; from 24 Institutes spanning 58 breeding programmes at different stages of the adoption process; from 14 Universities where faculty members are using and/or teaching the BMS, partially or entirely; and from 134 “champions” engaged in the deployment plans and in supporting their peers. “Because IBP has a very wide application, it will speed up crop improvement in many parts of the world and in many different environments. What this means is that new crop varieties will be developed in a more rapid and therefore more efficient manner,” concludes Graham. 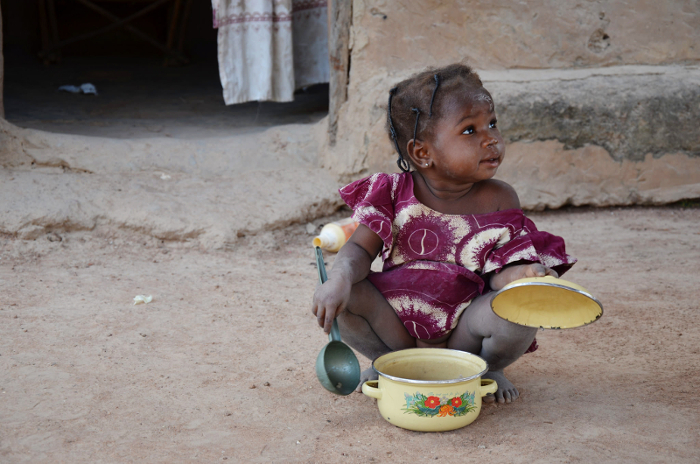 Each year, millions of people in Senegal go hungry for several months, many surviving on no more than one meal a day. Locals call this time soudure – the hungry period. 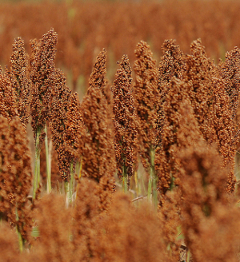 It typically lasts from June through to September, when previous winter and spring cereal supplies are exhausted and people wait anxiously for a bountiful autumn cereal harvest. 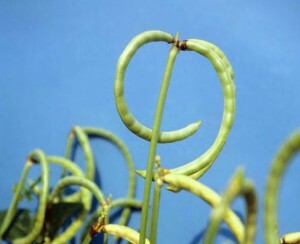 During this period, a bowl of fresh green cowpea pods once a day is the best that many people can hope for. Cowpeas are the first summer crop to mature, with some varieties ready to harvest in as little as 60 days. 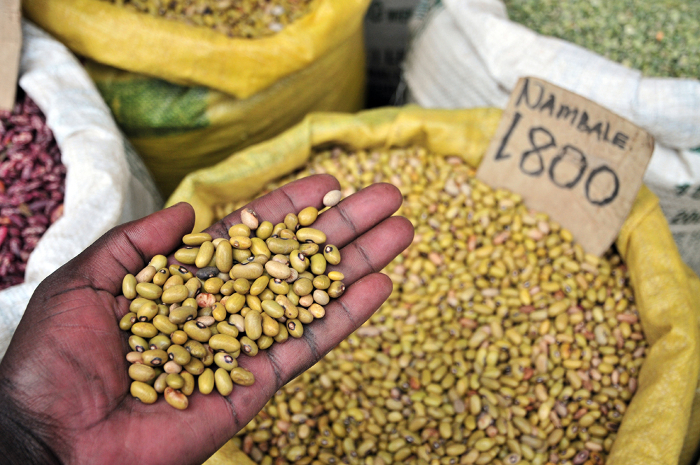 While cowpeas provide valued food security in Africa, yields remain low. 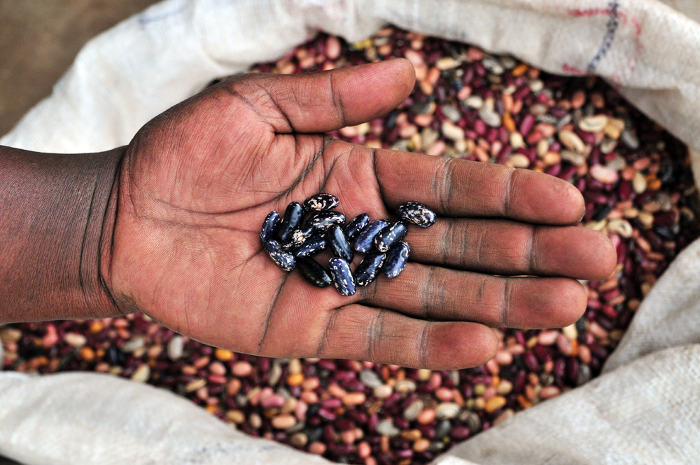 In Senegal, average cowpea yields are 450 kilograms per hectare, a mere 10–30 percent of their potential. This poor productivity is primarily because of losses due to insects and diseases, but is sometimes further compounded by chronic drought. 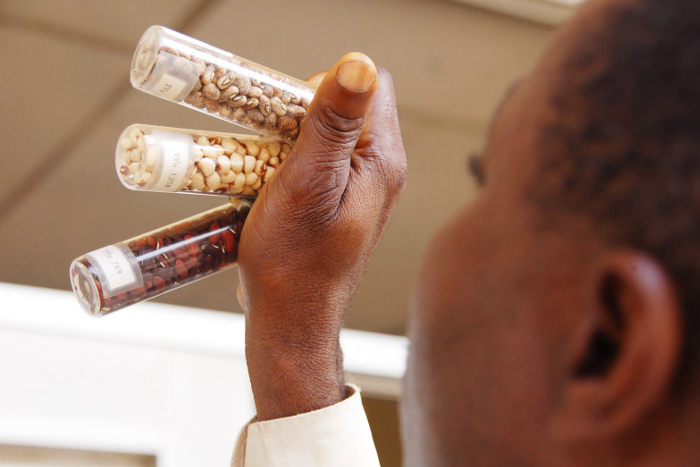 In 2007, the CGIAR Generation Challenge Programme (GCP) brought together a team of plant breeders and geneticists from Burkina Faso, Mozambique, Nigeria, Senegal and the USA to collaborate on cowpea. 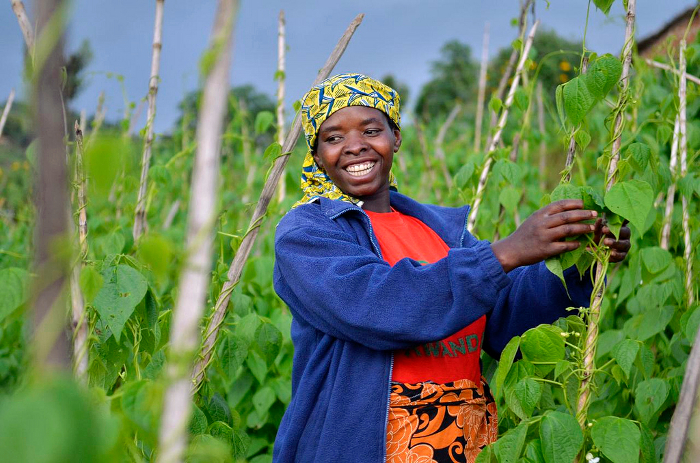 Their goal was to breed varieties that would be higher yielding, drought tolerant and resistant to pests and diseases, and so help secure and improve local cowpea production in sub-Saharan African countries. 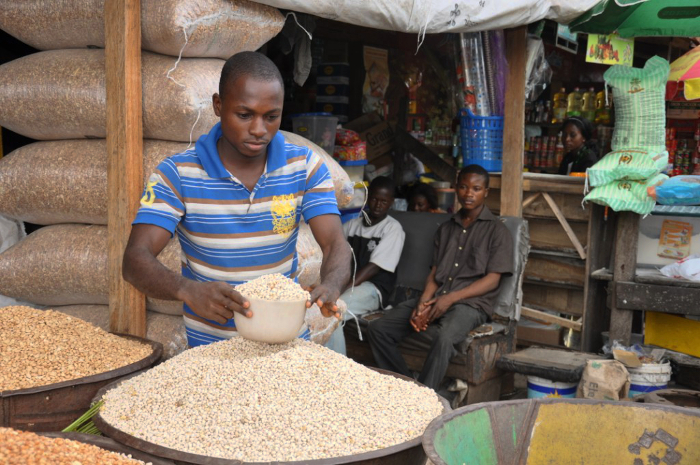 A trader selling cowpea at Bodija market, Ibadan, Nigeria. A type of legume originating in West Africa, cowpeas are also known as niébé in francophone Africa and as black-eyed peas in the USA. 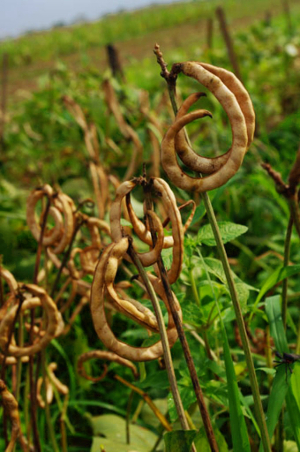 They are well adapted to drier, warmer regions and grow well in poor soils. 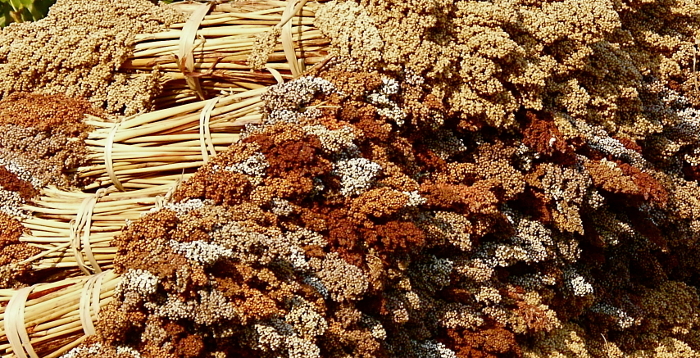 In Africa, they are mostly grown in the hot, drought-prone savannas and very arid sub-Saharan regions, often together with pearl millet and sorghum. 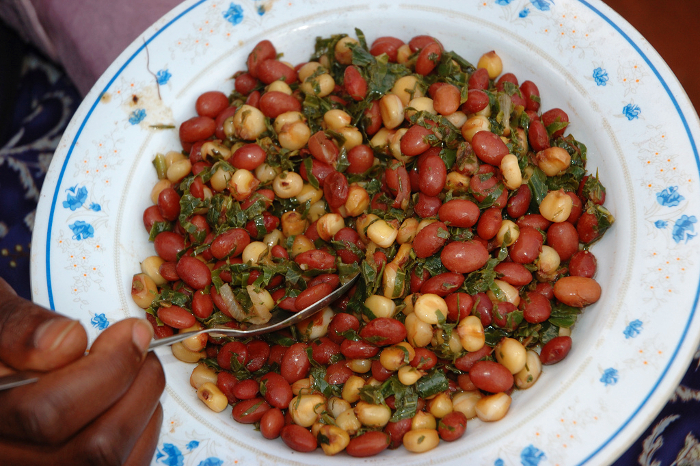 Nutritionally, cowpeas are a major source of dietary protein in many developing countries. 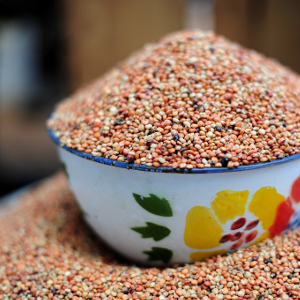 Young leaves, unripe pods and peas are used as vegetables, and the mature grain is processed for various snacks and main meal dishes. 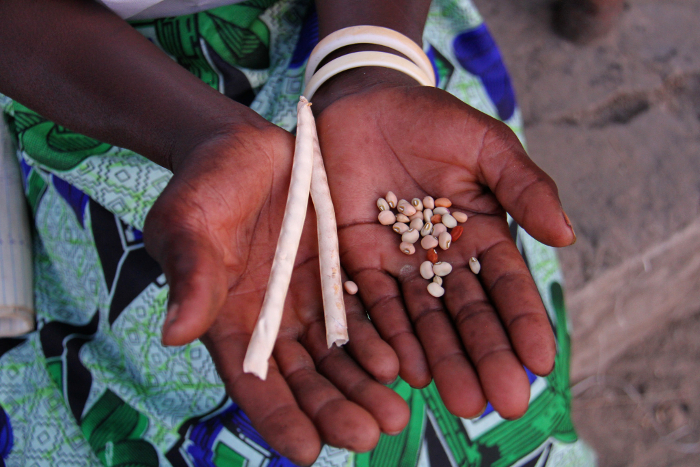 As a cash crop, both for grain and animal fodder, cowpea is highly valued in sub-Saharan Africa. 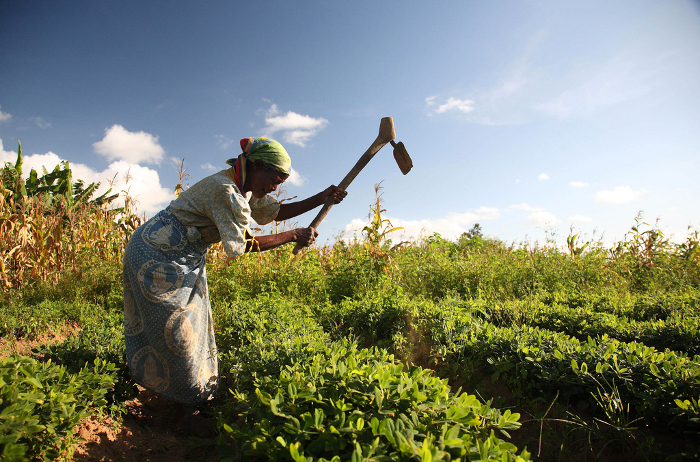 Worldwide, an estimated 14.5 million hectares of land is planted with cowpea each year. 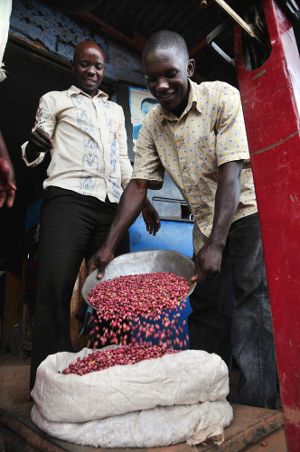 Global production of dried cowpeas in 2010 was 5.5 million tonnes, 94 percent of which was grown in Africa. 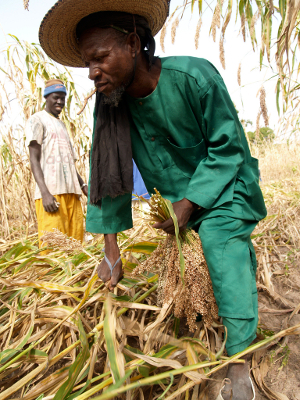 In 2011, Senegal experienced its third drought within a decade. 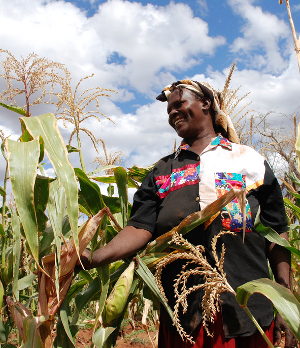 Low and erratic rainfall led to poor harvests in 2011 and 2012: yields of cereal crops (wheat, barley and maize) fell by 36 percent compared to 2010. Consequently, the hungry period in 2012 started three months earlier than usual, making gap-fillers like cowpea even more important. 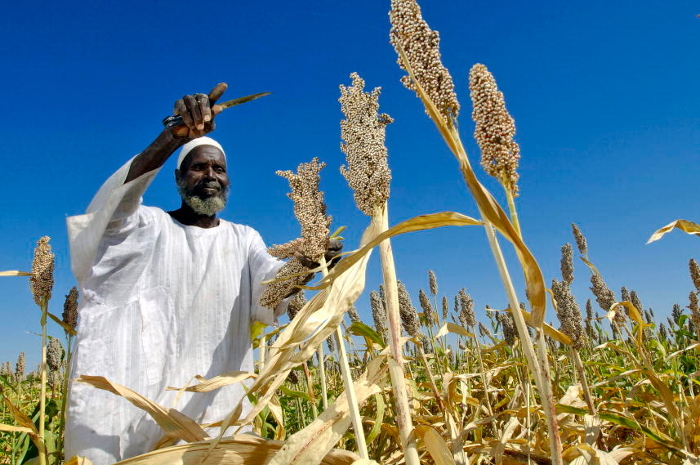 In fact, cereal production in sub-Saharan African countries has not seen substantial growth over the last two decades – total area, yield and production grew by only 4.3 percent, 1.5 percent and 5.8 percent, respectively. 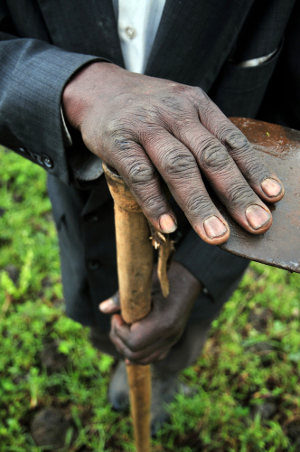 Climate change is expected to further compound this situation across sub-Saharan Africa. 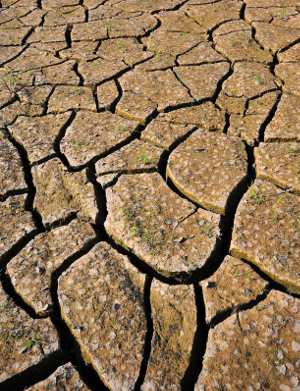 Droughts are forecast to occur more frequently, weakening plants and making them more vulnerable to pests and diseases. 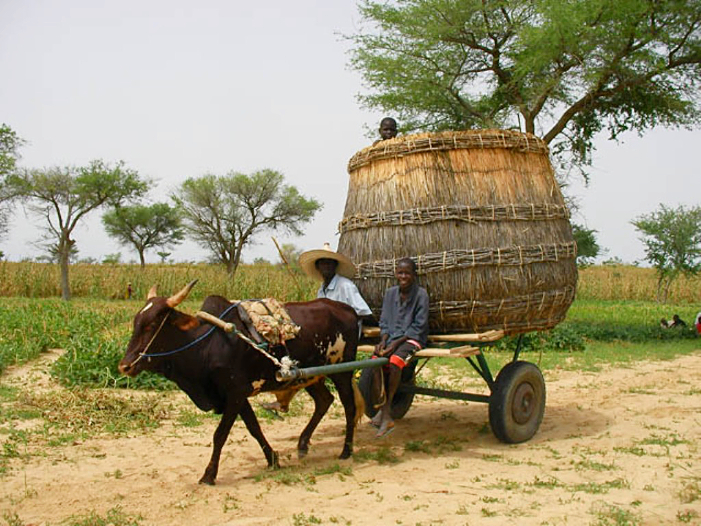 Farmers in Northern Nigeria transport their cowpea harvest. 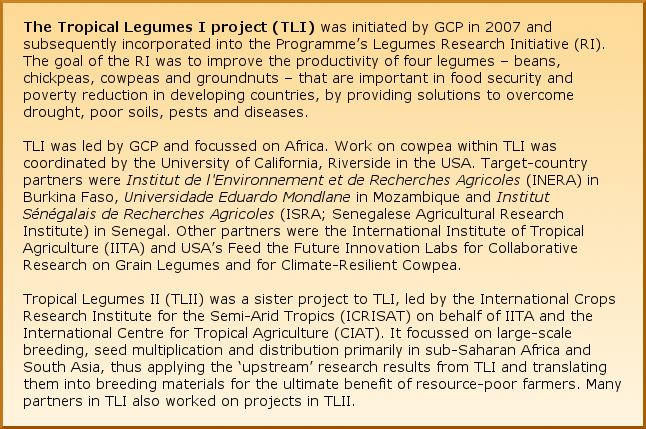 For seven years, Phil and his team at UCR coordinated the cowpea component of the Tropical Legumes I (TLI) project led by GCP (see box below). The objective of this work was to advance cowpea breeding by applying modern, molecular breeding techniques, tools and knowledge to develop lines and varieties with drought tolerance and resistance to pests and diseases in the sub-Saharan African countries Burkina Faso, Mozambique, Nigeria and Senegal. 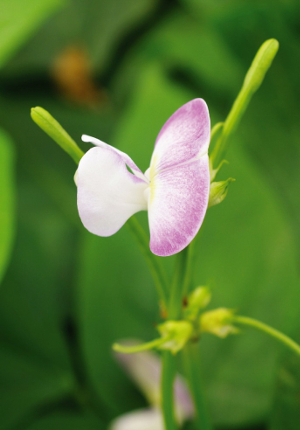 The molecular breeding technology that UCR uses for cowpeas is based on finding genes that help cowpea plants tolerate insects and diseases, identifying markers that can indicate the presence of known genes, and using these to incorporate valuable genes into higher yielding varieties. Phil explains that the first priority of the project was to map the cowpea genome. To use an analogy, think of the plant’s genome as a story: its words are the plant’s genes, and a molecular marker works as a text highlighter. Molecular markers are not precise enough to highlight specific words (genes), but they can highlight sentences (genomic regions) that contain these words (genes), making it easier and quicker to identify which plants have them. Traditionally, breeders have needed to grow plants to maturity under appropriately challenging conditions to see which ones are likely to have useful traits, but by using markers to flag valuable genes they are able to largely skip this step, and test large amounts of material to choose the best parents for their crosses, then check which of the progeny have inherited the gene or genes. 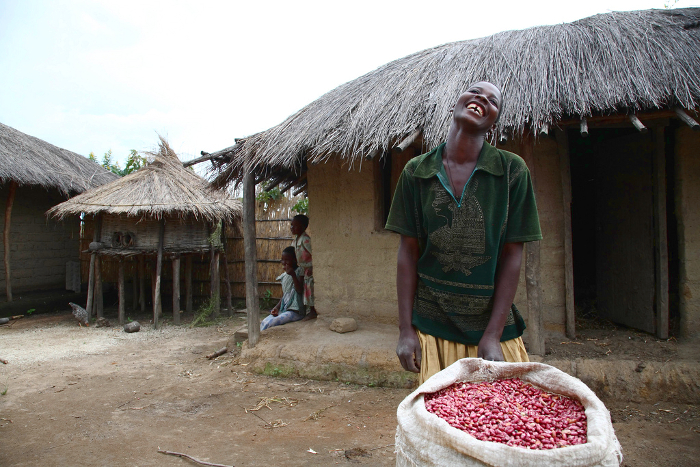 A farmer pleased with her cowpea plants. 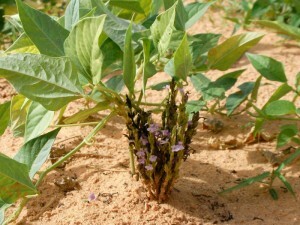 The main focus of the cowpea component in TLI was to optimise marker-assisted recurrent selection (MARS) and marker-assisted backcrossing (MABC) breeding techniques for sub-Saharan African environments and relevant traits. MARS identifies regions of the genome that control important traits. 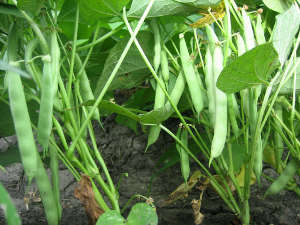 In the case of cowpeas, these include drought tolerance and insect resistance. It uses molecular markers to explore more combinations in the plant populations, thus increasing breeding efficiency. MABC is the simplest form of marker-assisted breeding, in which the goal is to incorporate a major gene from an agronomically inferior source (the donor parent) into an elite cultivar or breeding line (the recurrent parent). Major genes by themselves have a significant effect; it’s therefore easier to find a major gene associated with a desired trait, than having to find and clone several minor genes. The aim is to produce a line made up almost entirely of the recurrent parent genotype, with only the selected major gene from the donor parent. 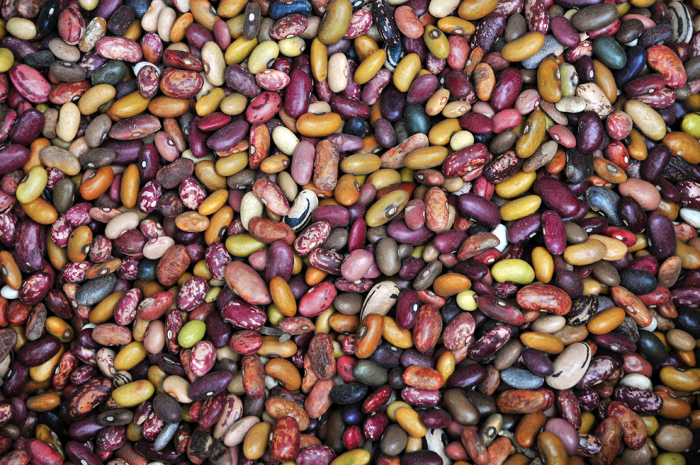 Using the genome map and molecular markers, the UCR team identified 30 cowpea lines with drought tolerance and pest resistance from 5,000 varieties in its collection, providing the raw material for marker-assisted breeding. 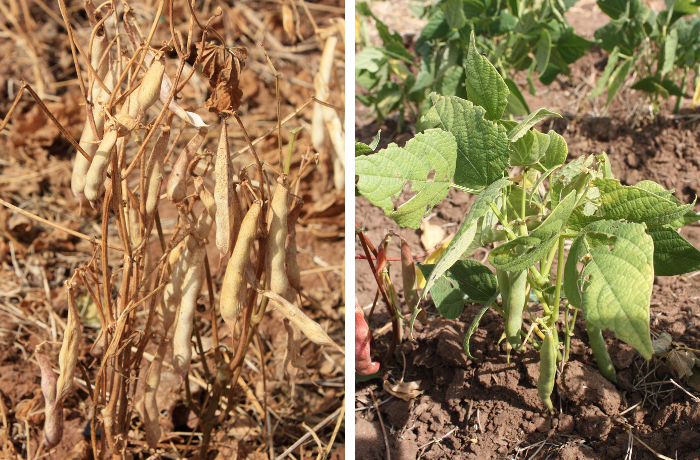 “Once we knew which lines had the drought-tolerance and pest-resistance genes we were looking for, we crossed them with high-yielding lines to develop 20 advanced cowpea lines, which our African partners field tested,” says Phil. 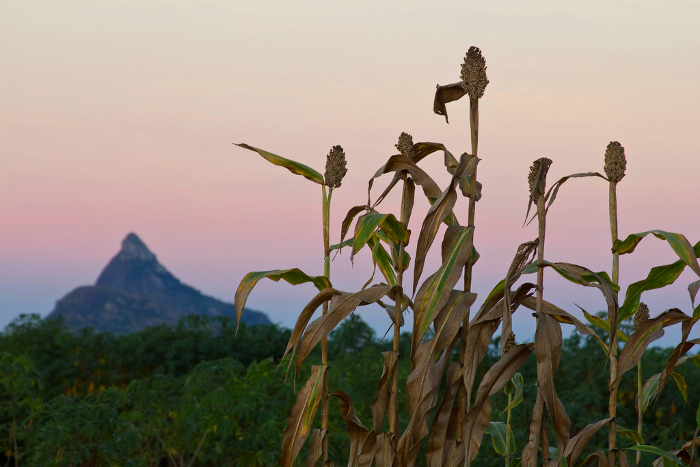 The lines underwent final field tests in 2014, and the best-yielding drought-tolerant lines will be used locally in Burkina Faso, Mozambique and Senegal to develop new higher yielding varieties that will be available to growers by 2016. 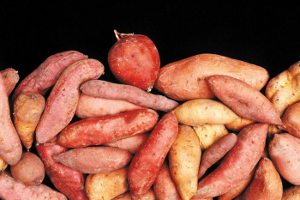 “While we are still some time off from releasing these varieties, we already feel we are two or three years ahead of where we would be if we were doing things using only conventional breeding methods,” says Ndiaga. A parasitic Striga plant, in a cowpea experimental plot. 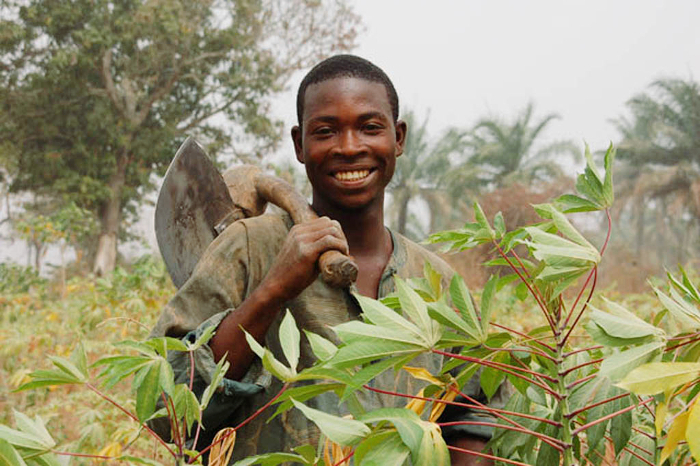 The genome map and molecular markers have helped cowpea breeders like Ousmane Boukar, cowpea breeder and Kano Station Representative with the International Institute of Tropical Agriculture (IITA), headquartered in Nigeria, to locate the genes in cowpeas that play a role in expressing desirable traits. 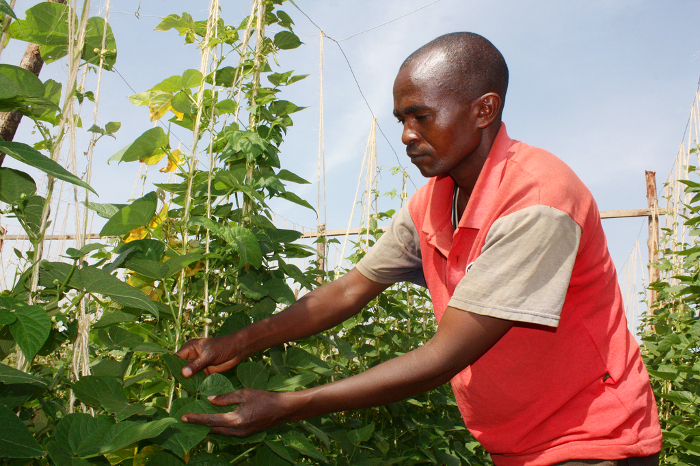 Ousmane, who was GCP’s cowpea Product Delivery Coordinator, says, “We have used this technology to develop advanced breeding lines that are producing higher yields in drier conditions and displaying resistance to several pests and diseases like thrips and Striga. We expect these lines to be available to plant breeders by the end of 2015. 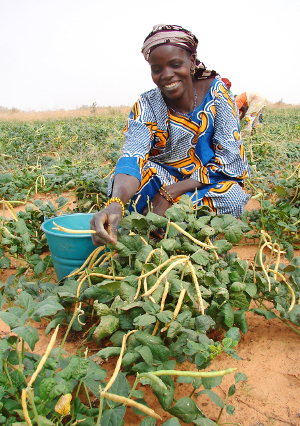 Cowpea is an important crop for the people of Burkina Faso. Over 10 million farmers produce on average 800,000 tonnes of cowpeas each year, making the country the third largest producer in the world, behind neighbours Nigeria and Niger. 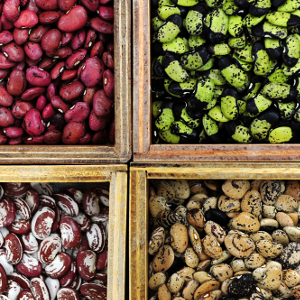 Much of Burkina Faso’s cowpea crop is consumed domestically, but the government sees potential in increasing productivity for export to Côte d’Ivoire and Ghana in the south. This new venture would improve the country’s gross domestic product (GDP), which is the third lowest in the world. 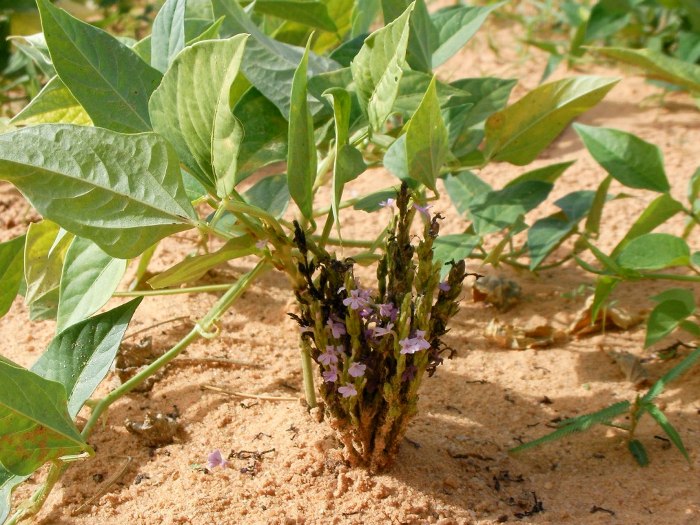 “The government is very interested in our research to improve cowpea yields and secure them against drought and disease,” says Issa Drabo, lead cowpea breeder with the Institut de l’Environnement et de Recherches Agricoles (INERA) in Burkina Faso. 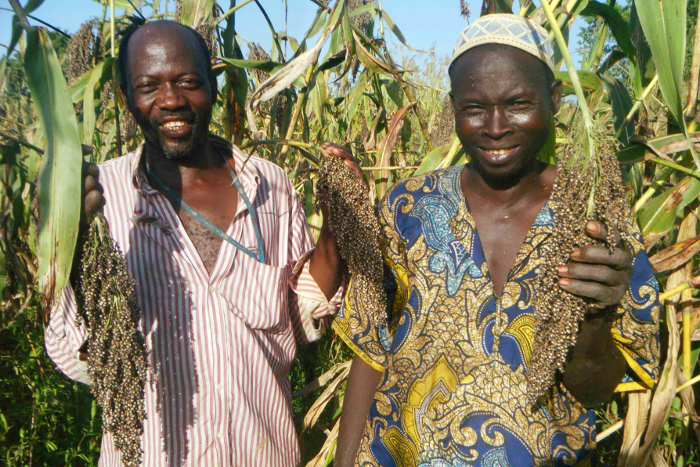 Farmers in Burkina Faso discuss cowpea varieties during participatory varietal selection activities. The whole process takes four to six weeks, from taking the samples to making a decision on which plants to cross. 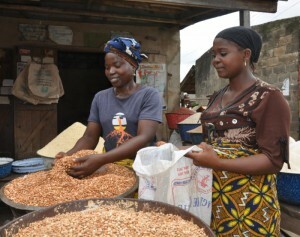 A trader bagging cowpeas at Bodija market, Ibadan, Nigeria. To reduce their African partners’ reliance on UCR, researchers from the university, including Phil, have been training young plant breeders and PhD students from collaborating institutes. Independent of the cowpea project, they have also been joining GCP’s Integrated Breeding Platform (IBP) training events in Africa to help breeders understand the new technologies. Issa Drabo reports that in 2014 two of his young researchers from Burkina Faso completed their training in GCP’s Integrated Breeding Multiyear Course, conducted by UCR and the IBP team. One of Issa’s researchers at INERA, Jean-Baptiste de la Salle Tignegré, says the course helped him understand more about the background genetics, statistical analysis and data management involved in the process of molecular breeding. 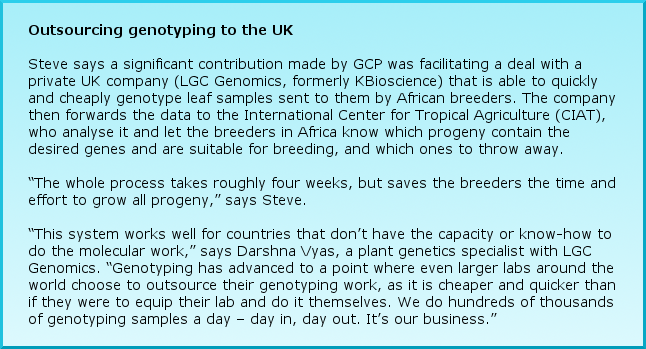 “Because of the course, we are now able to analyse the genotype data from LGC,” he says. In 2010, the Universidade Eduardo Mondlane (UEM) joined the cowpea component of TLI, three years after the project started. “We were a little late to the party because we were busy setting up Mozambique’s first cowpea breeding programme, which only began in 2008,” recalls Rogerio Chiulele, a lecturer at the university’s Faculty of Agronomy and Forestry Engineering and lead scientist for cowpea research in Mozambique for TLI. 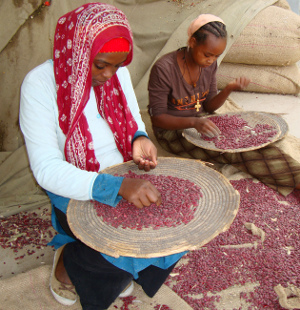 That year (2008), UEM received a GCP Capacity building à la carte grant to establish a cowpea-breeding programme for addressing some of the constraints limiting cowpea production and productivity, particularly drought, pests and diseases. 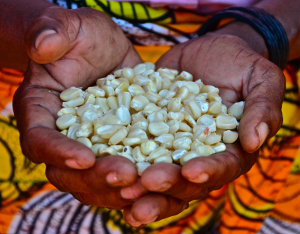 As in Burkina Faso and Senegal, in Mozambique cowpeas are an important source of food, for both protein and profit, particularly for the poor. Cowpeas rank as the fourth most cultivated crop in Mozambique, accounting for about nine percent of the total cultivated area, or an estimated four million hectares of smallholder farms. 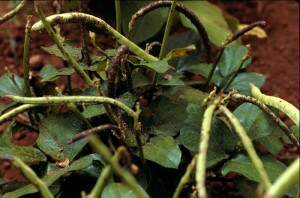 Cowpea plants infested by aphids. Rogerio says that farmers in his country, just as in other parts of Africa, struggle to reach their full yield potential because of climate, pests and diseases. 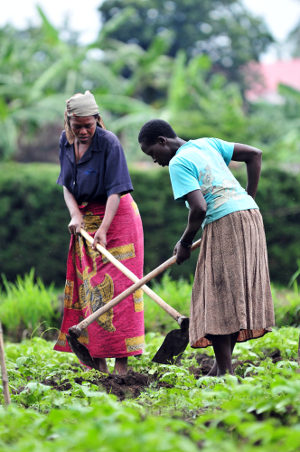 “Several insect pests – such as aphids, flower thrips, nematodes and pod-sucking pests – can substantially reduce cowpea yield and productivity in Mozambique,” he says. “Cowpea aphids can cause problems at any time in the growing season, but are most damaging during dry weather when they infest seedlings that are stressed from lack of water. In wetter parts of the country, flower thrips – which feed on floral buds – are the most damaging insect pest.” These insects are also major pests in Burkina Faso and Senegal, along with hairy caterpillar (Amsacta moloneyi), which can completely destroy swaths of cowpea seedlings. Mature cowpea pods ready for harvesting. Since 2010, Rogerio’s team have quickly caught up to Burkina Faso and Senegal and plan to release three higher yielding new lines with drought tolerance in 2015. One of these lines, CB46, is based on a local cowpea variety crossed with a UCR-sourced American black-eyed pea variety that displays drought tolerance, which potentially has huge market appeal. 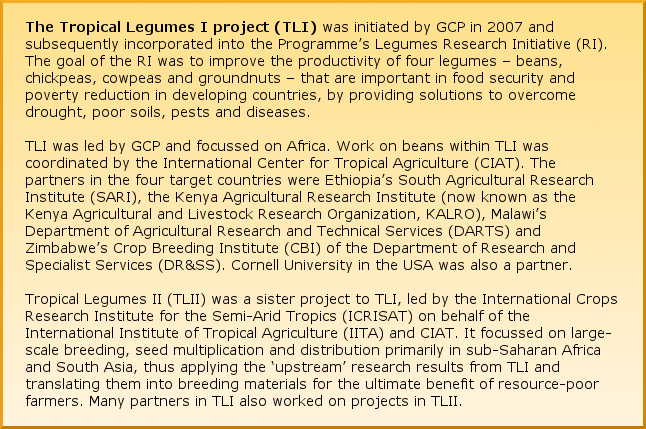 All these extra qualities are important to consider in any breeding programme and are a key objective of the Tropical Legume II (TLII) project (see box above). 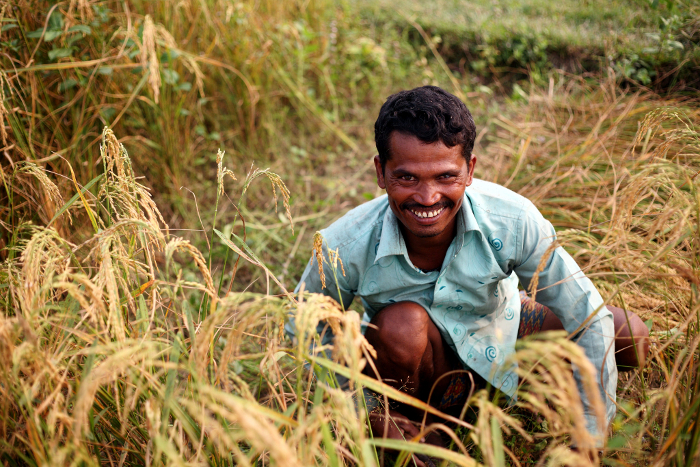 TLII activities, led by ICRISAT, seek to apply products from TLI to make an impact among farmers. “TLII focuses on translating research outputs from TLI into tangible products, including new varieties,” says Ousmane Boukar, who works closely with Ndiaga, Issa and Rogerio in TLI and TLII. Cowpea flower with developing pods. Part of Ousmane’s GCP role as Product Delivery Coordinator for cowpeas was to lead a network of African cowpea and soybean breeders, and he champions the need for breeders to share information and materials as well as collaborating in other ways so as to sustain their breeding programmes post-GCP. 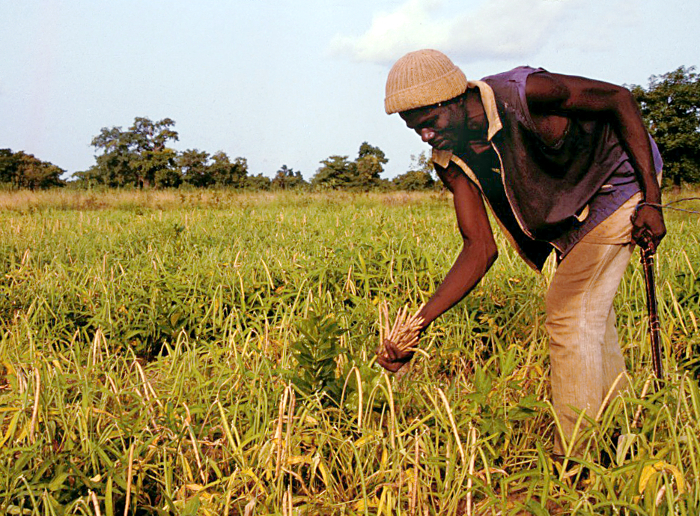 Farmer harvesting mature cowpea pods. In Senegal, Ndiaga is hopeful that the work that the GCP project has accomplished has set up cowpea breeders in his country and others for the next 20 years. 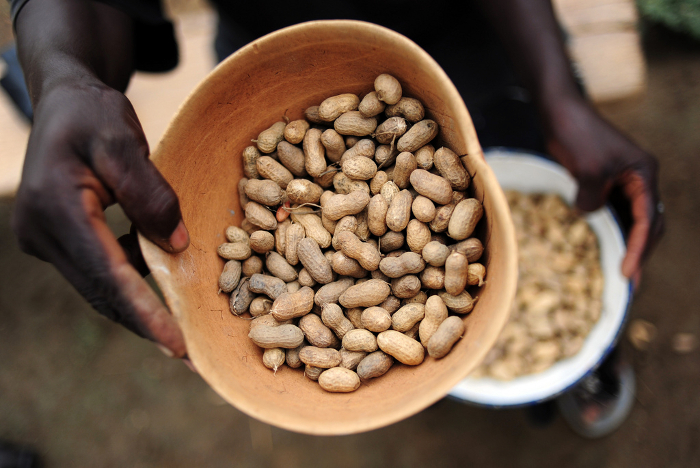 “Both GCP’s and UCR’s commitment to build capacity in developing countries like Senegal cannot be valued less than the new higher yielding, drought-tolerant varieties that we are breeding,” says Ndiaga. “They have provided us with the tools and skills now to continue this research well into the future. For as long as peoples and countries have traded wheat, drought has continually played a part in dictating its availability and price. Developed countries have become more able to accommodate the bad years by using intensive agricultural practices to grow and store more wheat during more favourable years. However, farmers, traders and consumers are still at the mercy of drought when it comes to wheat availability and prices. A recent example where drought in just one country inflated the world’s wheat prices was in the People’s Republic of China during 2010–11. For almost six months, eight provinces in the north of China received little to no rain. Known as the breadbasket of China, these eight provinces grow more than 80 percent of the country’s total wheat and collectively produce more wheat than anywhere else in the world. 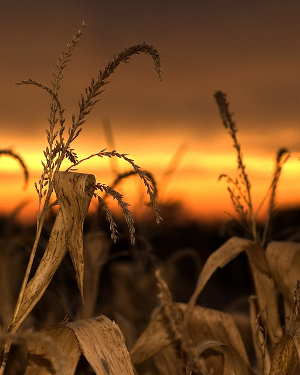 It was the worst drought to hit the provinces in 60 years. With over 1.3 billion mouths to feed, China’s demand for wheat is high and ever increasing. When this demand was coupled with the reduced wheat yield caused by the severe 2010–11 drought, wheat prices around the world rose. 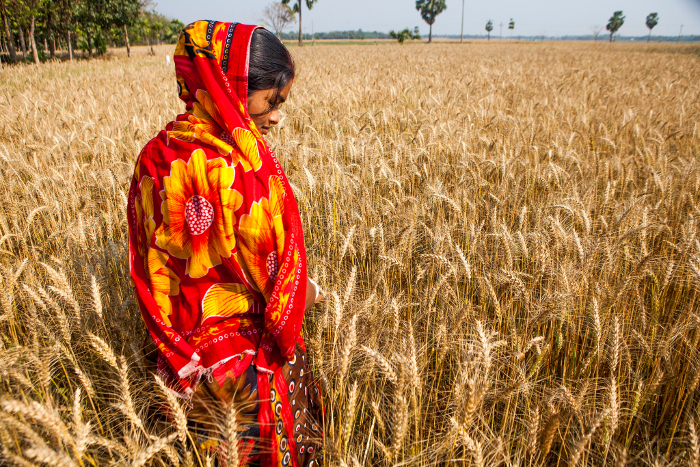 While this price rise was beneficial for wheat growers in other countries, it made wheat unaffordable for many consumers and traders in developing nations. Although this was a one-in-60-year event, previous droughts had already made locals question the sustainability of wheat production in this naturally dry region of China, where water consumption has increased in the past 50 years due to intensive agriculture, industry and a growing and increasingly urbanised population. 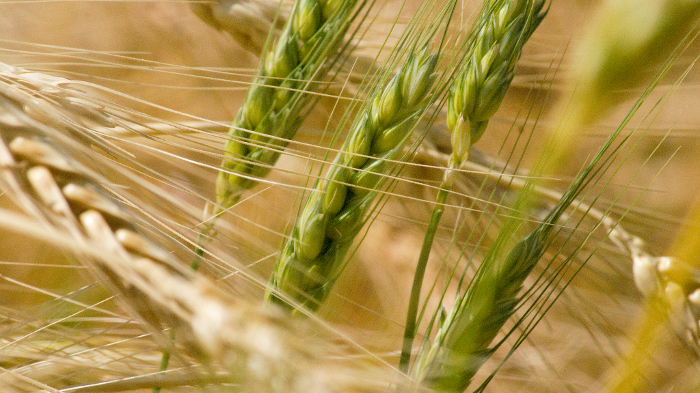 Wheat growers and breeders know they need to find wheat varieties and apply practices that will help them adapt to and tolerate drier conditions and still produce sustainable yields. Luckily, they have help from a community of breeders around the world. 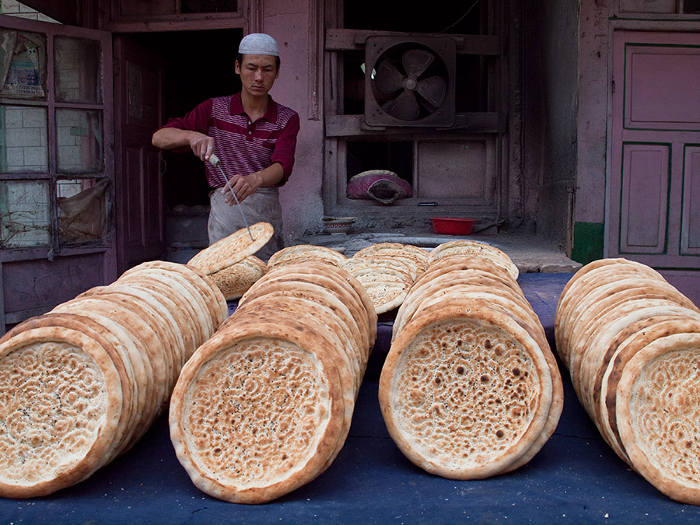 An Uyghur baker displays his bread in Kashi, Xinjiang, China. 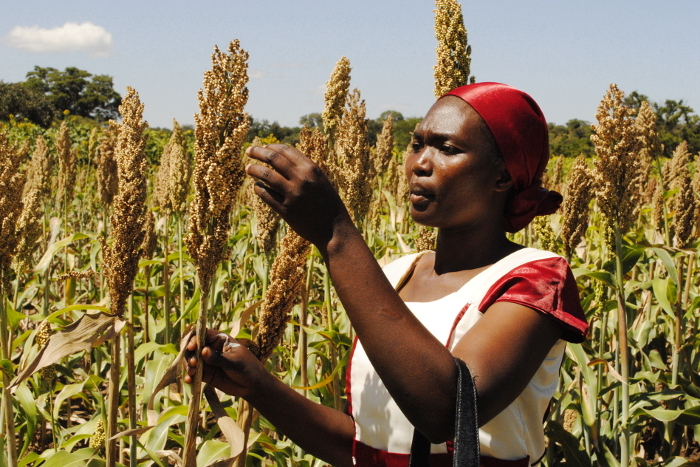 In March 2009, 70 international plant breeding leaders and experts from the public and private sector converged in Montpellier, France, as part of a CGIAR Generation Challenge Programme (GCP) initiative to draw up roadmaps to improve plant-breeding efficiency in developing countries. 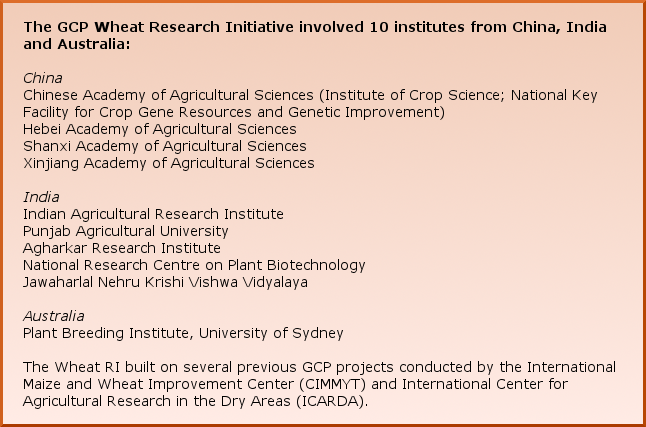 The resulting roadmap for wheat became the GCP Wheat Research Initiative (RI), with Richard as Product Delivery Coordinator. It had two very clear destinations in mind: China and India. Richard explains why China and India were targeted – as the world’s two wheat-production giants – in the video below. Like China, India is an extremely water-stressed country, with the water table in many places falling at an alarming rate. In North Gujarat alone, an established wheat district in western India, the water table is reported to be dropping by as much as six metres per year. 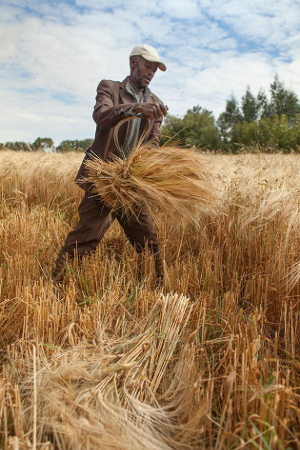 Delivering wheat varieties that have improved water-use efficiency and higher tolerance to drought will have the greatest impact in these countries, given they are the two largest producers of wheat worldwide. One project that impressed Richard was that led by Satish Misra, GCP Principal Investigator and senior wheat breeder at Agharkar Research Institute, Pune, India. In a collaboration with the University of Sydney, Australia, and the International Maize and Wheat Improvement Center (CIMMYT), the project identified novel genes associated with drought- and heat-tolerance traits in ancestral wheat lines (of emmer wheat). 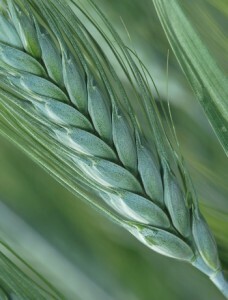 Emmer wheat is a minor crop grown mainly in marginal lands, where farmers can produce a small harvest but nowhere near the yield of more elite cultivated lines. Satish explains that emmer wheat lines are very useful for breeders because they have a larger diversity of novel genes than more popular wheat types, such as durum or bread wheat. A reference set reduces the number of choices that breeders have to search through, from thousands down to a few hundred – in this case, 300 emmer lines. Satish and Richard’s teams crossed these synthetic lines with durum wheat lines and identified 41 resulting lines with high levels of stress tolerance. These are undergoing further evaluation in India and Australia. 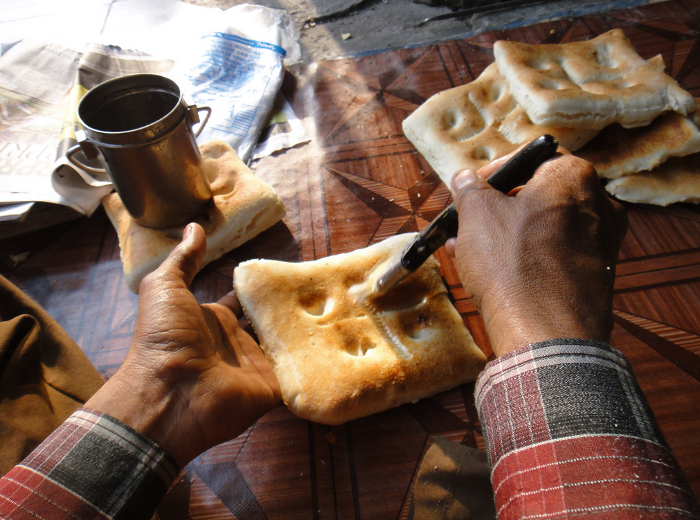 A baker butters naan bread in Hyderabad, India. 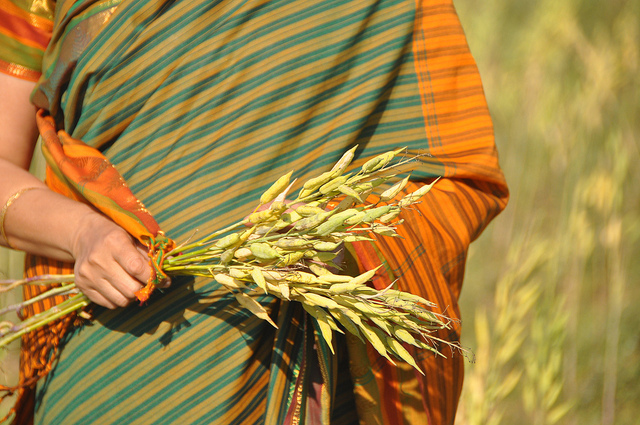 For Richard, the preliminary success of the Wheat RI is due, at least in part, to the speed with which national breeding programmes in both China and India are learning and incorporating new molecular-breeding techniques. This does not mean, however, that the work is not focused on building capacity, given that molecular breeding is still a relatively new concept for many breeders around the world. 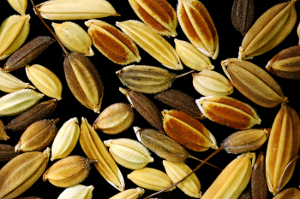 Ruilian Jing says the China project is continually working to educate and train wheat breeders in molecular-breeding techniques. “When we started the project, we found that most institutions that focus on wheat breeding in China had the equipment to do marker-assisted breeding but were unsure how to use it,” says Ruilian, professor in plant breeding at the Chinese Academy of Agricultural Sciences (CAAS) and Principal Investigator for the Wheat RI’s drought-tolerant wheat project in China. Much of Ruilian’s work in China has been in educating these breeders so they can start achieving outcomes. Ruilian explains that those leading the charge to become educated in molecular-breeding techniques are young researchers, including seven PhD students and one Master’s student supported by the project in China. One such researcher who is enthusiastically applying these new approaches is Yonggui Xiao, a molecular plant breeder at the Institute of Crop Science, CAAS. “Working as part of this GCP project gave me my first opportunity to practice using molecular-breeding techniques to improve the quality and yield of wheat under drought conditions,” says Yonggui. 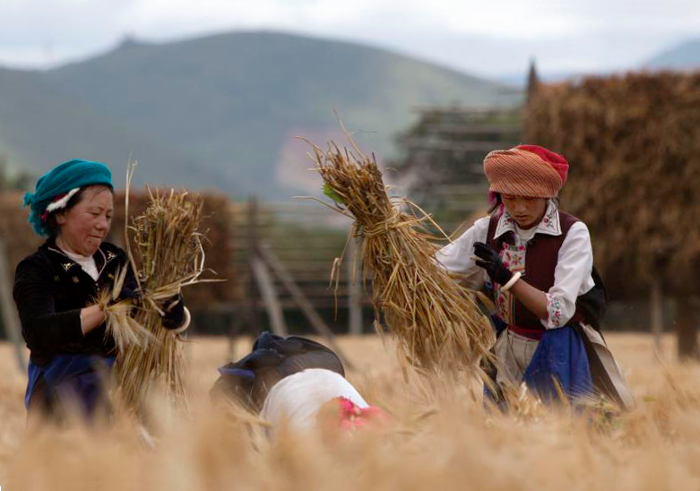 Women of the Nakhi people harvest wheat in Songzanlinsi, Yunnan, China. 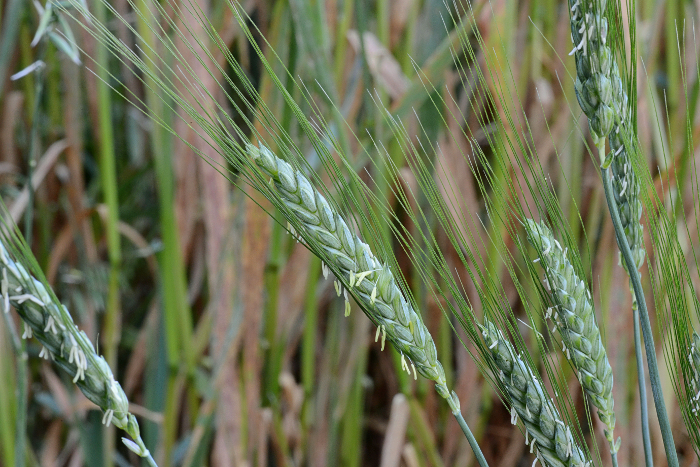 Yonggui is now expanding the application of the technology to develop varieties with resistance to powdery mildew, a fungal disease that can reduce wheat yields and quality during non-drought years. “Overall, we have been impressed by how these new techniques complement our conventional breeding techniques to improve selection efficiency, in turn reducing the time and costs of producing advanced varieties,” says Yonggui. Success stories like these make Ruilian’s job easier as she tries to encourage more and more plant breeders to experiment with these new breeding techniques. Across the Himalayas, Ruilian’s Indian counterpart, Vinod Prabhu, is just as pleased with the progress and results his team are producing. “Over the last five years, we have discovered several water-use efficiency traits and their related genes, bred new lines to incorporate the genes and traits and run national trials, all of which would be unheard of using only conventional breeding practices,” says Vinod, Head of the Genetics Division at the Indian Agricultural Research Institute in New Delhi and the Principal Investigator for the Wheat RI’s drought-tolerant wheat project in India. By the end of the projects in November 2015, partners in China and India will deliver 15–20 new wheat lines with drought and heat tolerance, adapted to each country’s conditions. An additional target for both China and India is to produce four wheat varieties with improved water-use efficiency and higher heat tolerance. 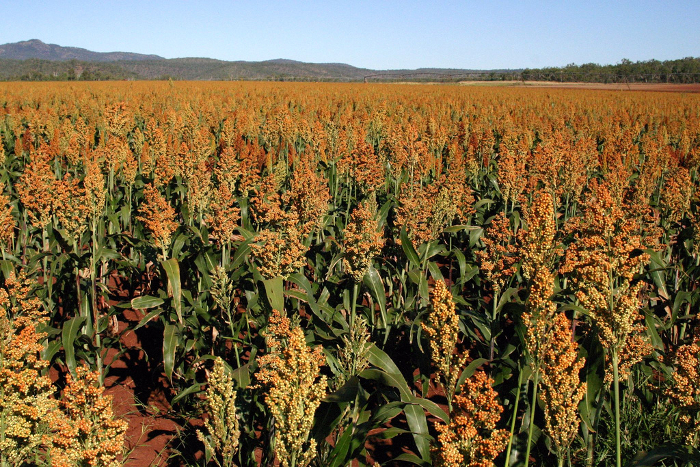 These varieties will have the potential to cover about 24 million hectares and minimise yield loss from heat or drought, or both, by up to 20–50 percent. Vinod’s primary role has been to coordinate the Indian centres working on the project (see box at end). But he has also been working to convince Indian plant breeders that these unconventional, new breeding techniques will improve their efficiency and aid in their quest to breed for heat- and drought-tolerant wheat varieties. “Many world-leading wheat breeders were wary at first, but they have definitely started to see the merit in using the technology to enhance their conventional methods as we edge closer towards releasing new varieties in such a short time,” says Vinod. 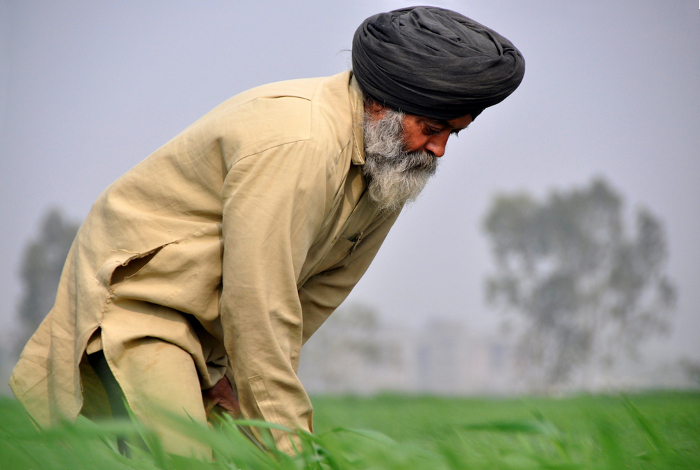 Wheat seed ready for planting in Punjab, India. For more information on conventional versus molecular breeding, or marker-assisted breeding, see our quick guide here on the Sunset Blog. One of the most important processes of the Wheat RI, and plant breeding in general, is phenotyping: measuring and recording observable characteristics of the plant such as drought tolerance or susceptibility to pests and diseases. Breeders phenotype the plants they have developed to see which ones have the traits they are interested in and also – for molecular breeding to be possible – to establish links between specific genes and specific traits. Unfortunately, phenotyping has caused a bit of trouble for both Chinese and Indian partners. The challenge stems from the fact that one person’s observations about a plant’s phenotype or characteristics may not be the same as another person’s. 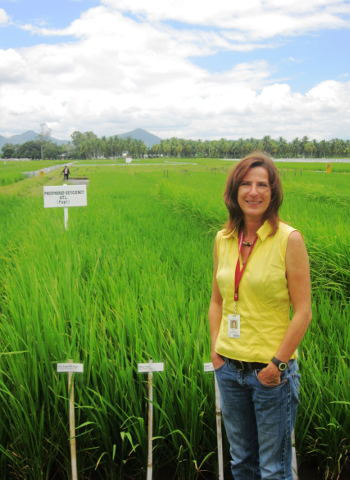 “This is always a challenge for any collaborative plant-breeding project,” says Vinod. 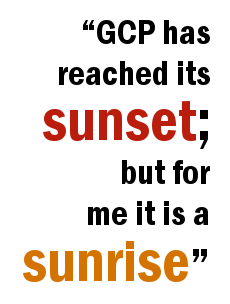 “Unless all trials are inspected by one person, there will always be a risk of inconsistent observations. Scientists from South Asia learn phenotyping on a training course at CIMMYT. To help overcome this inconsistency, one of the first activities of the Wheat RI was to develop phenotyping protocols that allowed researchers in different research institutes and countries to collect comparable data. 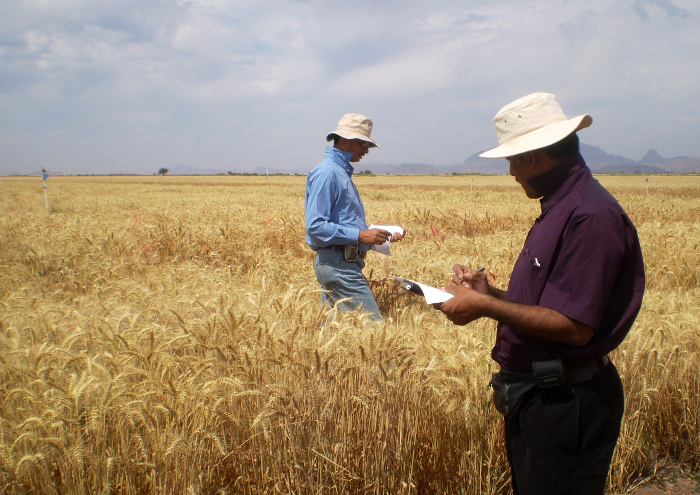 GCP enlisted Matthew Reynolds, a wheat physiologist at CIMMYT, to help with this. This problem is not unique to China and India. Another GCP wheat project is providing promising results to help overcome the risk of inconsistency and increase the efficiency and accuracy of phenotyping. Led by Fernanda Dreccer, based at Australia’s Commonwealth Scientific and Industrial Research Organisation (CSIRO), in collaboration with the International Center for Agricultural Research in the Dry Areas (ICARDA), the project is developing a reliable phenotyping approach to detect drought-adaptive traits in wheat crops using cheap and simple tools. Another important aspect of phenotyping that Fernanda’s project is helping with is constant and consistent analysis of a crop’s surroundings. “It’s just as important to measure the environment of the crop as it is [to measure] the crop itself to make a correlation between an environmental impact and a plant’s reaction,” says Fernanda. 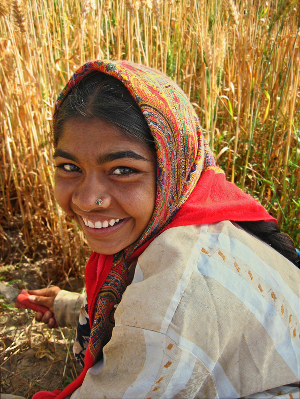 A young farmer in her wheat field in India. Although a plant breeder’s work should be simplified and made more efficient by combining molecular-breeding technologies with advanced phenotyping techniques and protocols, the reality is not necessarily so easy. 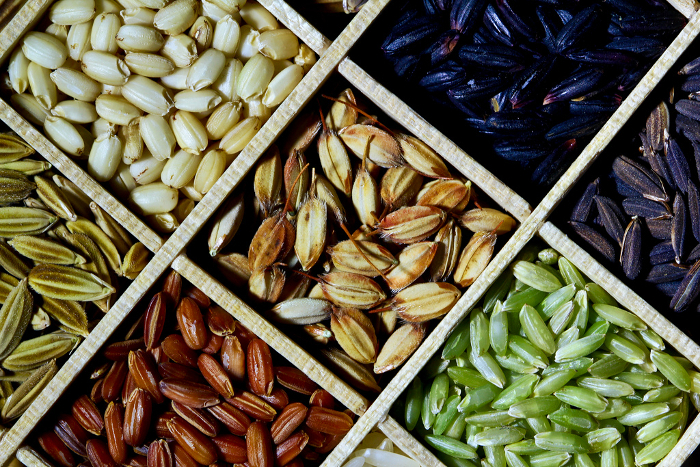 There are many steps to the plant-breeding puzzle, all of which produce data. 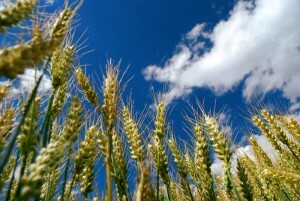 The more advanced the techniques and – in the case of wheat – the more complex the plant’s genome, the more pieces of data breeders need to sift through to find solutions. GCP recognised this problem before the RIs began and has, since 2009, been developing the Breeding Management System (BMS) – a suite of interconnected software designed to manage the mass of data – as part of its Integrated Breeding Platform (IBP). Watch Richard on adoption of IBP tools in the video below. Vinod credits two things for the successful development of new wheat varieties and integration of new breeding techniques and data-management systems: a clear, logical plan and friendly competition between China and India to breed the first new drought-tolerant varieties. “The initial plan, which Richard helped develop in Montpellier, was logical and well thought out. Although we initially thought it was overambitious in its objectives, we have been able to meet them so far, which is a great credit to the team and their enthusiasm to try these new technologies and see for themselves the benefits first hand. “What has also helped is our competitive spirit, as we would like to achieve the objectives before the Chinese breeders do. Our breeders are always asking me for updates on how China is progressing!” Vinod adds, with a chuckle. For Richard this international collaboration, between two very different and proud cultures, allowed the project to broaden its scope and troubleshoot quicker than usual. “They [the Chinese and Indian researchers] think about problems in different ways. When you get a group of people in a room from different backgrounds, you can come up with great integrated plans, things you would never have come up with within just a national team,” says Richard. Watch Richard on the beauty of diversity in research partnerships in the video below. With the project concluding in 2015, both the Chinese and Indian researchers are working towards completing national trials and releasing their new, advanced drought-tolerant varieties to farmers and other breeders. 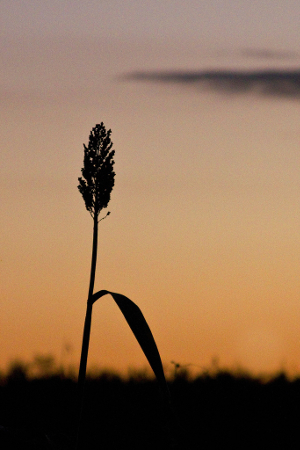 However, for Richard, the impact of the Wheat RI may not be fully recognised for 10–20 years. 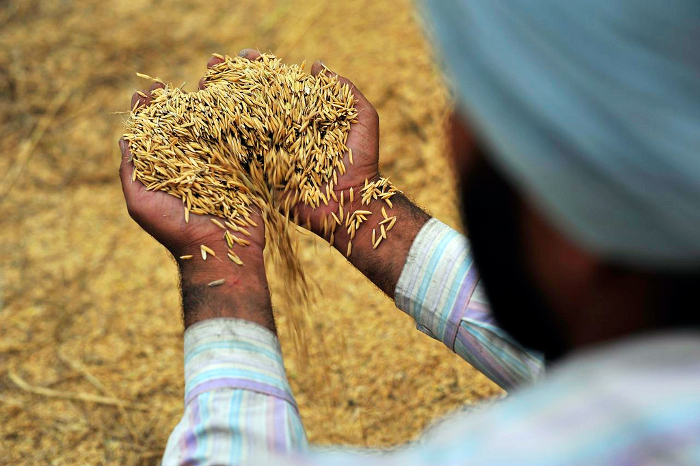 In the case of wheat, new drought-tolerant varieties will help secure both China’s and India’s wheat industries, helping to stabilise wheat yields, and consequently prices, the world over. These new varieties may not be the silver bullet for eliminating the risks of drought, but they will go a long way to mitigating its impact. 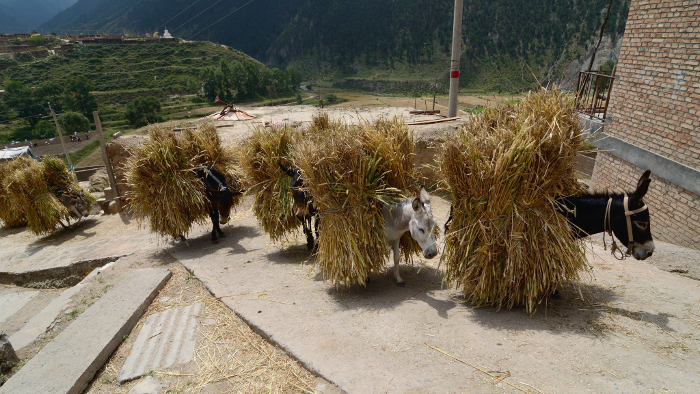 Donkeys bring home the wheat harvest in Qinghai, China. “Little had been done to advance the genetic diversity of lentils.” This was the picture back in 2005, recalls Aladdin Hamwieh, a scientist at the International Center for Agricultural Research in the Dry Areas (ICARDA) based in Lebanon. “Lentil has a narrow genetic base, meaning not too many varieties are used in production,” he explains. 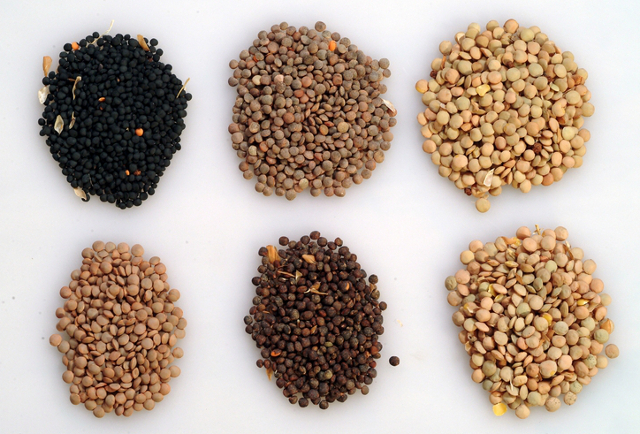 A small sample of the lentil diversity available in the ICARDA gene bank. It was on this premise that Aladdin joined a three-year global effort to capture and understand the genetic diversity of the world’s lentil varieties – a protein-rich crop that plays an integral part in the lives of many people in Central and West Asia and North Africa (CWANA), South Asia and North America. He was funded by the CGIAR Generation Challenge Programme (GCP) to develop a refined set of genetic reference materials for lentils so that plant breeders across the globe could access the best gene pool available to be able to improve food security in developing countries. “Essentially, the genetic make-up of lentil was repeatedly filtered until 15 percent of ICARDA’s gene bank was collected,” says Aladdin. ICARDA has the largest collection of lentil genes in the world. Some work had been done on improving the genetics of lentils to withstand harsh, dry conditions. 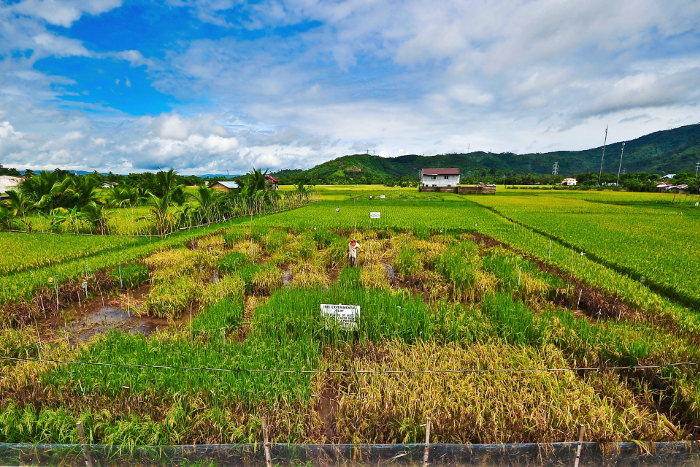 But it was not enough to prepare for the challenge the world is now facing – feeding almost 10 billion people by 2050 and climate conditions that mean longer dry periods and more erratic rainfall. The reference set captures the existing genetic diversity of lentils and makes it easier for scientists to search for genes that can help overcome the challenges to lentil production. It consists of about 150 accessions, or 15 per cent of the global collection studied (see box). 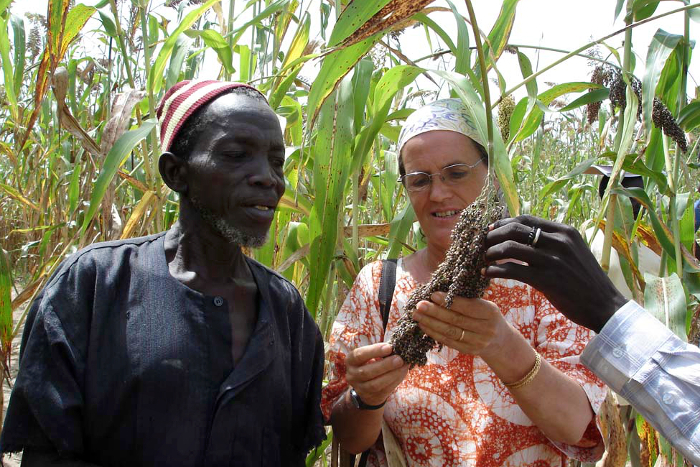 International cooperation and knowledge sharing are hallmarks of GCP, with one of the Programme’s key goals being to facilitate collaboration between scientists from across the globe in breeding new varieties of crops that can not only tolerate drought, but also resist diseases and tolerate poor soils. 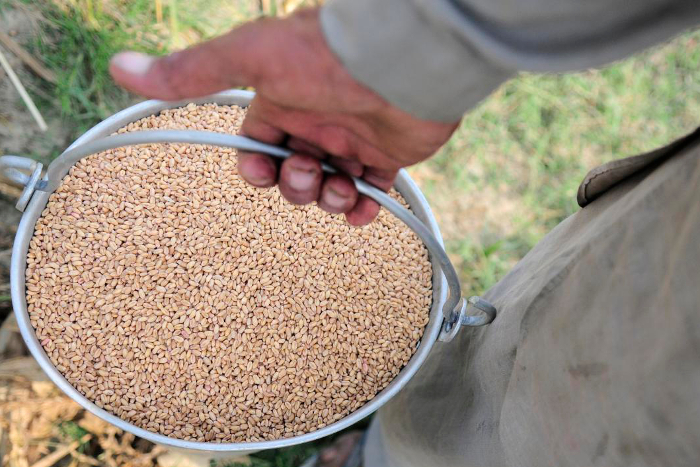 Ashutosh Sarker, a former lentil breeder and currently Coordinator and Food Legume Breeder for ICARDA’s South Asia and China Regional Program, says production challenges for lentils vary from country to country. While demand is rising globally, he says, some developing countries are having trouble meeting their own need for this staple food. 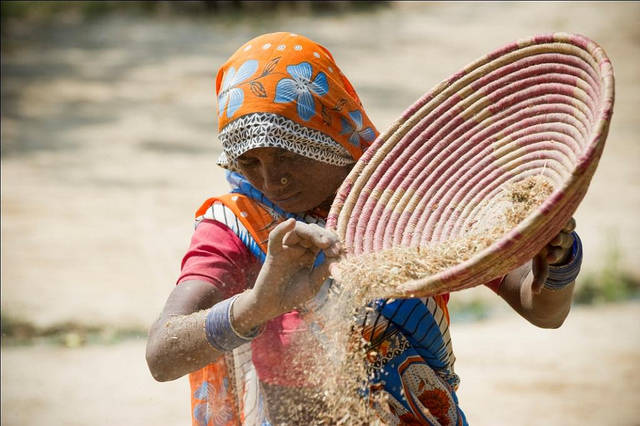 A woman farmer with lentils in Bihar, India. The reference collection serves as a common resource for all lentil breeders interested in the same crop. When Aladdin’s team studied the reference collection, they were able to identify favourable genes. Shiv Kumar Agrawal, who joined ICARDA in 2009, uses the reference set developed for GCP to identify and create markers for drought-tolerant and early-maturing traits for key lentil-producing countries, including Bangladesh, Ethiopia and India. “Developing more markers will help mitigate lentil’s barriers to production,” says Shiv, pointing to climate change and rising temperatures in production zones as adversely affecting lentil yields. 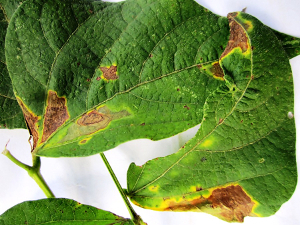 Markers are like genetic ‘tags’ that indicate which plants or seeds have particular genes, so markers related to relevant genes – for traits such as heat tolerance, for example – can help breeders choose which plant materials to use when developing a new variety. 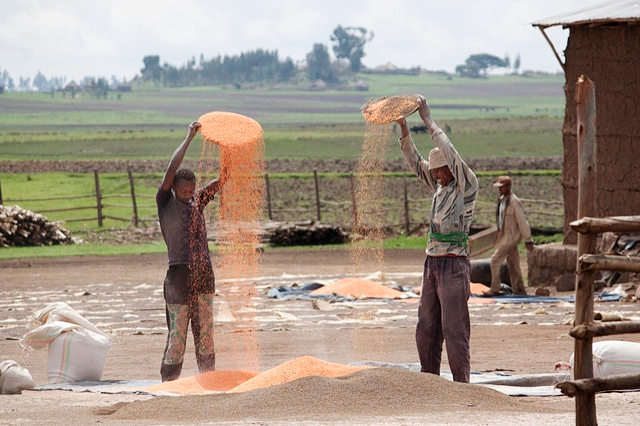 Farmers in Ethiopia winnow orange lentils. 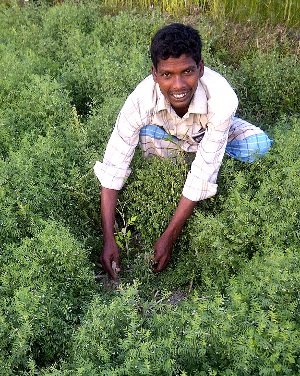 Farmer Minto with lentils in his field in Bangladesh. While achieving such lentil varieties may be some way down the track, Shiv and Karthika offer a small glimpse of what the future holds and the promise of making even more from GCP’s genetic reference set than what has been achieved so far. He reflects on the reality of how civil unrest in developing countries often means local agriculture is disrupted and crops destroyed, which can mean the loss of traditional varieties. Aladdin is adamant that this is important not only for developing countries but for the whole world. “We can’t make genes in future so this one we cannot lose,” he stresses. A ‘backup’ duplicate copy of ICARDA’s lentil collection is stored in the Arctic Circle at the Svalbard Global Seed Vault. Although GCP’s genetic research work on lentils came to an end in 2007, scientists all over the world can still access the materials – and are reaping other benefits from GCP’s work too. 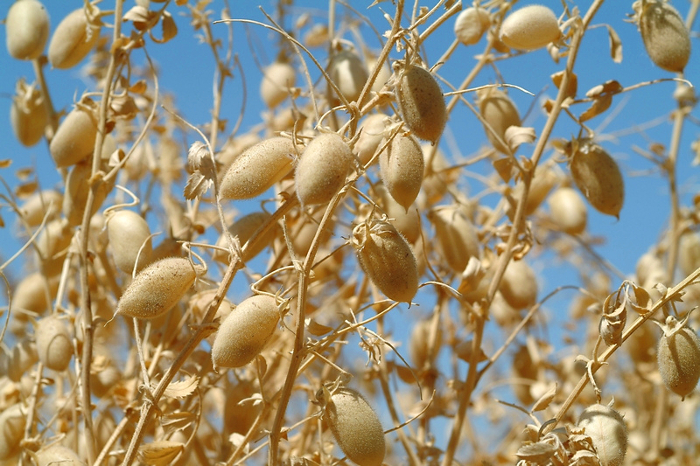 For example, ICARDA is using GCP’s Integrated Breeding Platform (IBP) – particularly the Breeding Management System (BMS) – for its lentil-breeding programme. Reflecting GCP’s collaborative spirit, Shiv explains that his team have not only successfully integrated use of BMS within their own programme, but have also included it in regular training programmes for developing country partners. ICARDA plans to implement the BMS to develop fieldbooks for Lentil International Elite Nurseries, using the IBFieldbook tool, and to distribute the books to developing country partners for data collection. 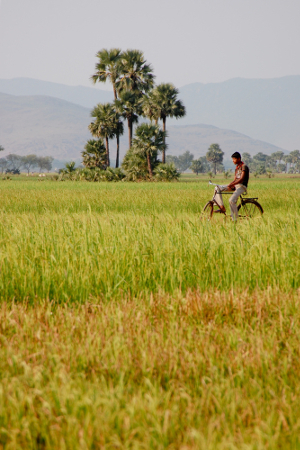 “Once the database is centralised, it will facilitate rapid access to breeding material and easy sharing of knowledge and technology to the developing country partners,” says Karthika. Such ongoing advances in breeding technologies since the outset of GCP mean the refining process can continue. “We should not stop,” says Aladdin, encouraging other lentil breeders and researchers to continue their work. A female farmer in India helps to harvest lentils by sifting them after fellow workers have beaten the stalks to remove the seeds from their pods.